To order pictures, click here to go to Harold Phillips Photography. 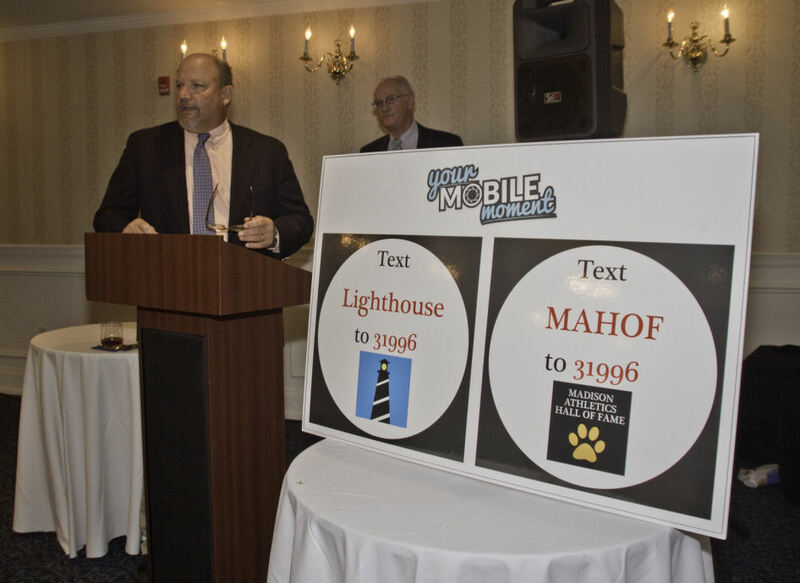 A special thanks to all of our 2015 sponsors! Grand Apizza Wm. C. Woods & Co., P.C. 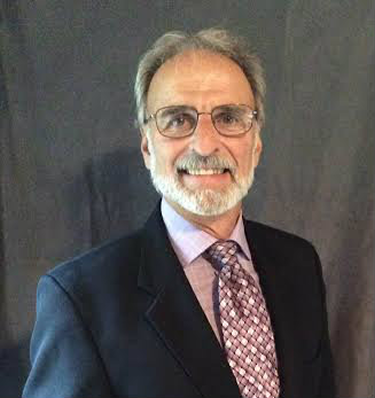 (Jim) Bombaci was a teacher and coach at Daniel Hand for over 30 years. He coached the Varsity Girls Basketball team for 24 seasons and assisted Willie Roze in coaching the Softball pitchers for three seasons. From the Fall of 1979, Jim involved himself in the extra-curricular of Hand Athletics. This allowed him to connect and motivate as many student athletes as possible. Coaching also enabled Jim to follow his personal passion for competition. His teaching of top level Physics students, and the "hands-on" electronic students, was enhanced by his involvement in sports. His classroom was a hub for students that aspired to make Hand more than their school, it was like a second home. Bombaci's classroom was a study in diversity, contrast, and productivity. There was always something going on. 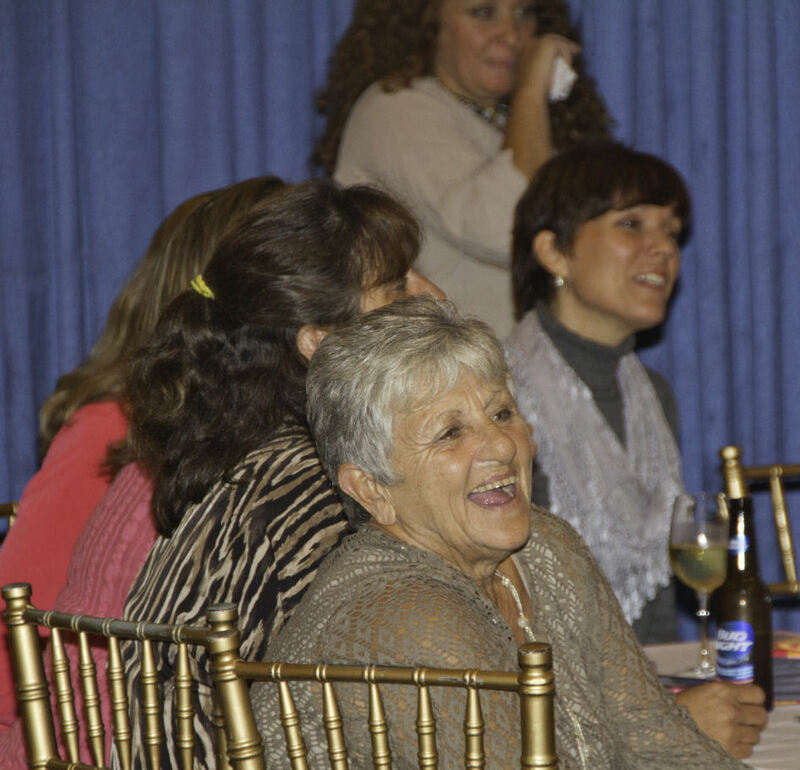 In all the venues: the classroom, the basketball court, the field, all among very different populations, Coach Bombaci's humor was successful in building bridges of respect and understanding. 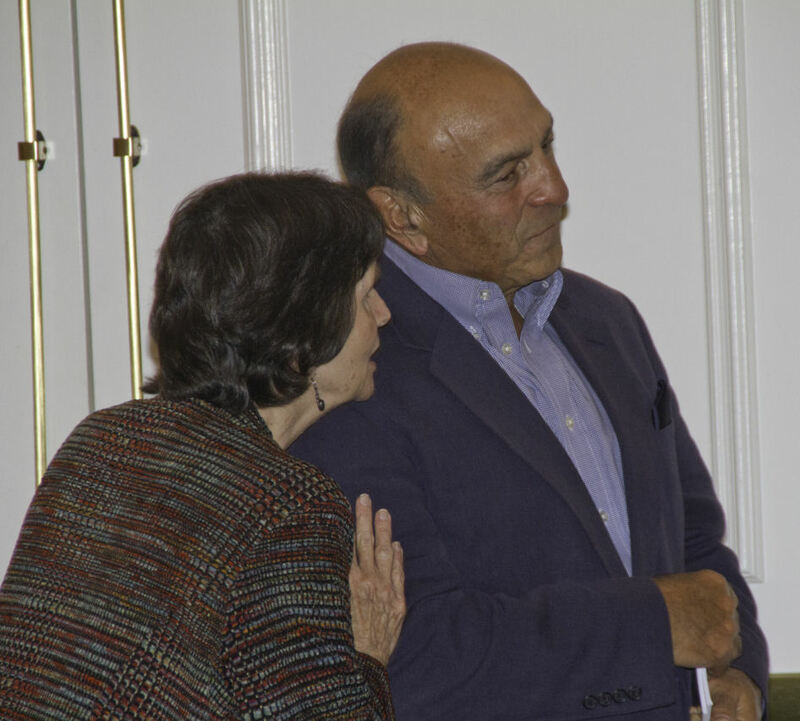 Bombaci was one of the coaches whose influence extended well beyond athletics and his students very often became fans of Hand Girls' Basketball. 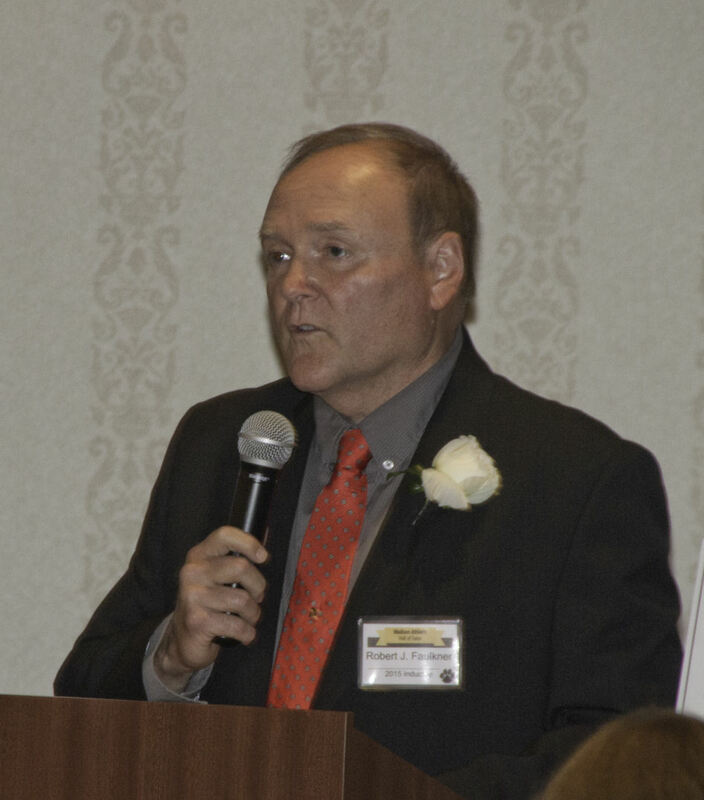 Jim began coaching Basketball at Hand during the 1979-80 season when he coached Madison Athletic Hall of Fame inductees Sandy (Gavin) Ashmore and Jennifer Fischer- Mueller in one of the most successful Hand seasons ever. 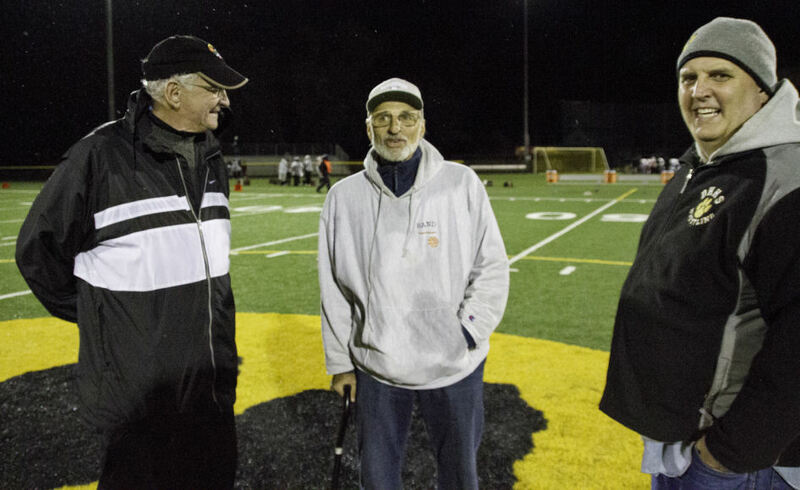 Jim immersed himself in athletics and was committed to adding to the Tiger legacy and to making the Girls' Basketball Program worthy of the Hand tradition. Jim took coaching seriously. He scouted opponents all over the state, scanned the newspapers and collected statistics of every team he might face down the road, kept meticulous records and spent hours every evening drafting practices, plays and viewing video that might make his team better. He was thorough. He modeled dedication. He had his teams as ready as they could possibly be. He was also known to scour the halls of Hand beginning in September looking for the tall girls who seemed to possess some basketball potential. His persistence almost always paid high dividends. Jim coached All-American Kirsten Anderson (Madison Hall of Fame inaugural class inductee) to a phenomenal career after recruiting her in the hallways during her freshman fall. 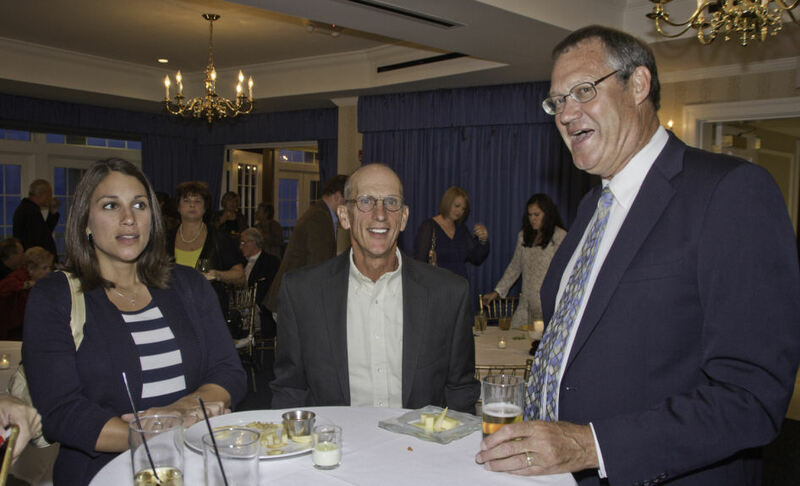 Jim shared that his "favorite thing about coaching girls' basketball was how hard everyone worked and how much all his players really cared about each other. Even that 1-19 season was special in that regard, everyone battled every day for each other and the record didn't matter." Today he is "proud to think that many of my players are still close friends and have such great memories." 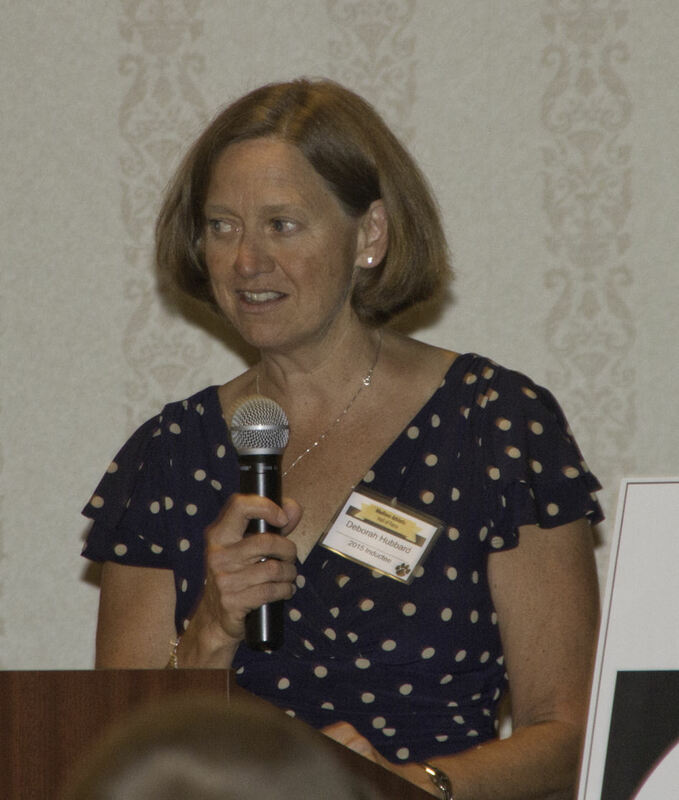 Former player Susan Salatto Leckey reflected on her experience as a basketball player at Hand. 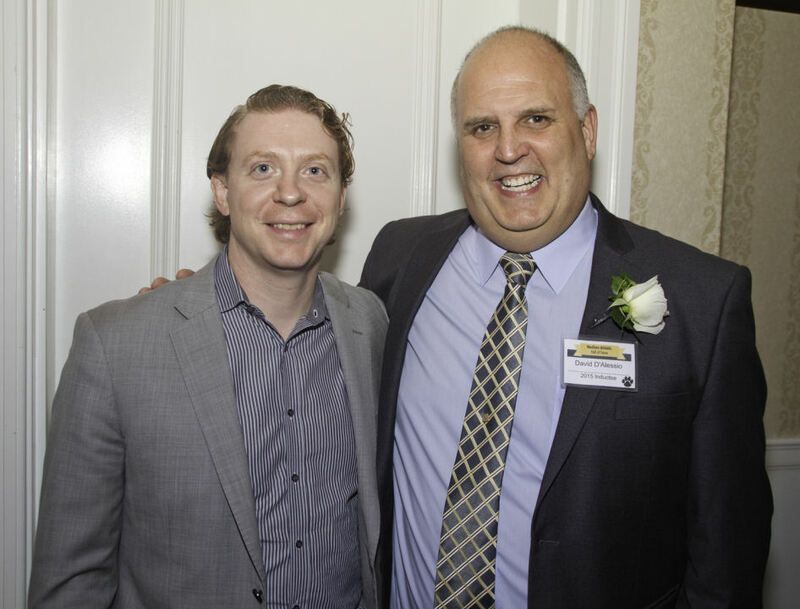 "When you played for Bombaci he convinced you that what you were doing was really important. For 24 seasons he demanded that the Hand Girls' Basketball players battle to be their best. We believed that our games were a demonstration of our character. His teams attracted a significant audience and were true examples of what Hand athletics is known for, a little grit and a whole lot of Tiger Pride. We were really proud to be Daniel Hand Basketball players." Ann Kirwin Anderson said "Bombaci gave 110% to our team. His passion for the game was contagious as many of his former players went on and played in college and beyond. He also inspired many to go into coaching." Jim Bombaci coached 36 years of high school girls' basketball and has a record of 511 wins to 305 losses. 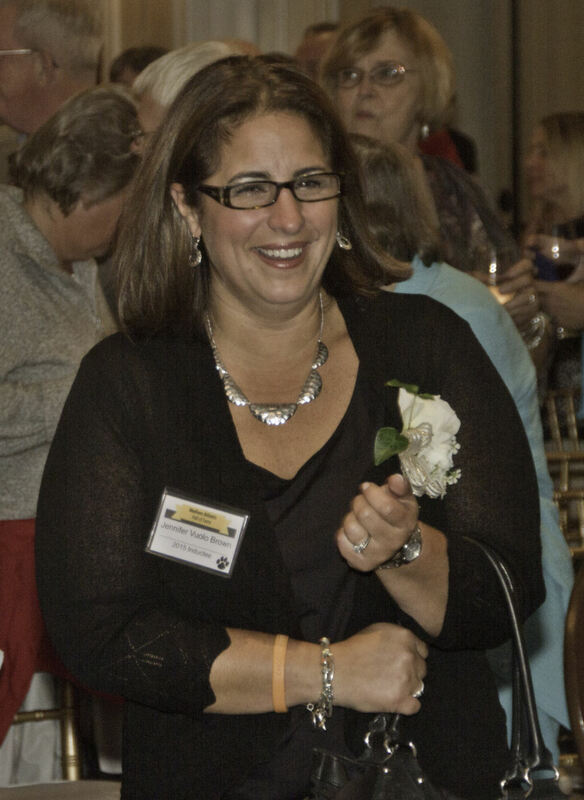 At Hand, Bombaci was 354 -189 with 7 League Championships, 21 of 24 appearances in the State tournament, 10 semi-final appearances and then a special season in 1999 that resulted in the first and only Daniel Hand Girls' Basketball State Championship. In his tenure Bombac's teams qualified for the State tournament 23 straight seasons, 33 of 36 overall appearances for Coach Bombaci. His basketball teams were highly respected for their tenacity and for their sportsmanship. Some of the most exciting Basketball came from 1981-84 when the Lady Tigers snapped a very long Westbrook win streak and continued on to capture 3 consecutive Shoreline Conference titles. Under Bombaci, Hand girls' basketball players were honored with five Class L, First Team All-State selections, six 1000+ point scorers and one All-American. 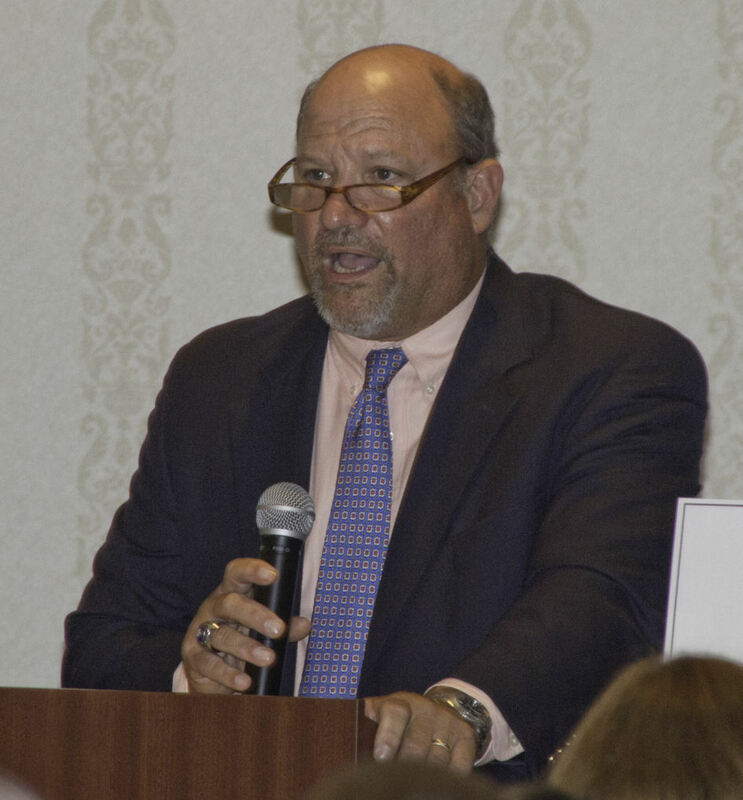 His coaching accolades include: induction into the Connecticut Women's Basketball Hall of Fame, the New Haven Tap-Off Club Distinguished Service Award and six Coach of the Year Awards (Ct. Board of Certified Officials COY, Ct. High School Coaches Association COY, Shoreline Conference COY, Ct. Shoot Out COY, and New Haven Tap-Off Club COY). He was selected to coach the Jewish Community All-Star team and was twice selected to coach in the Coaches' All Star Game. Jim also coached AAU for 14 seasons with two State Championships and 4 National Tournament qualifications. Jim retired from Daniel Hand in 2004. He did; however, continue to coach basketball at Haddam Killingworth High School for 8 seasons, winning another Shoreline Conference title and earning his 500th career victory. 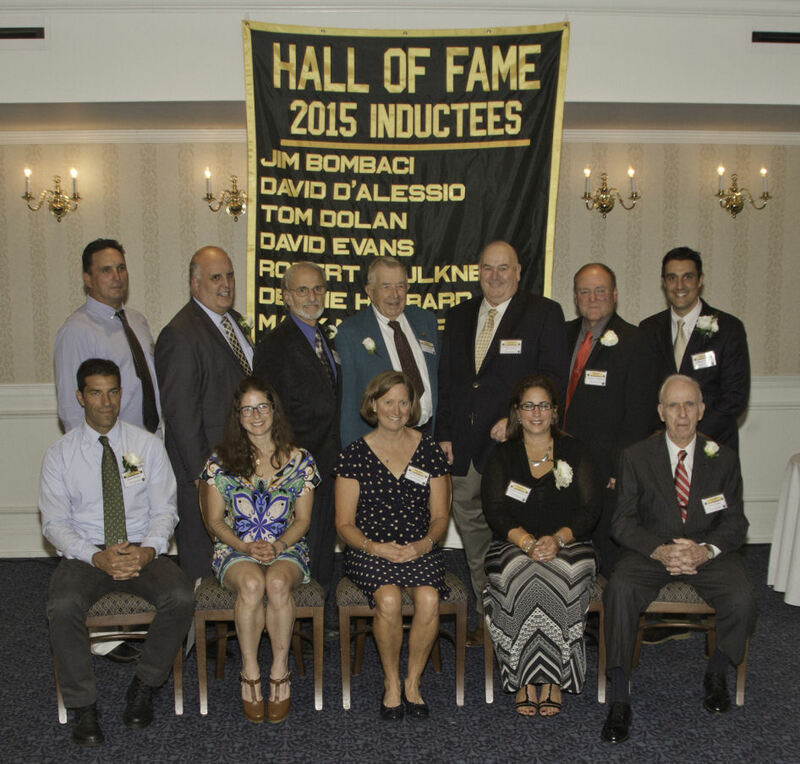 Bombaci is one of the winningest coaches in Ct. girls' basketball history. 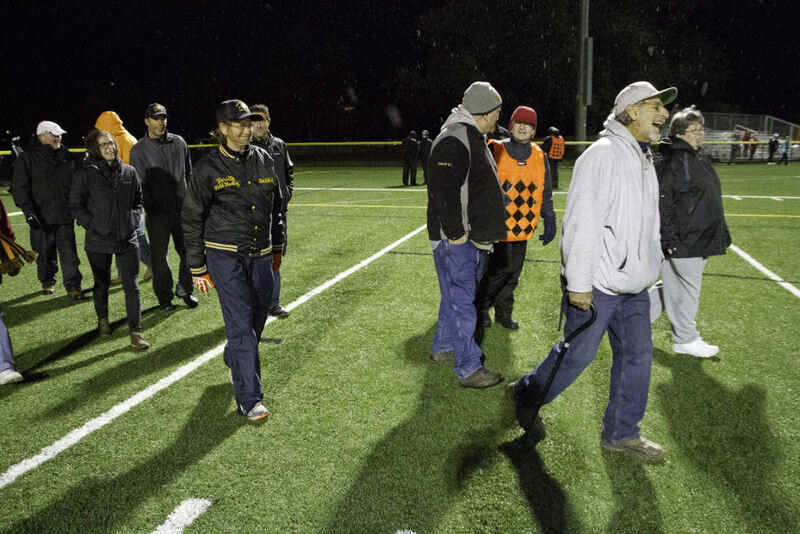 Beyond Coaching, Jim is still actively involved in both an over-60 men's softball and basketball leagues. He plays in a local band, rides his motorcycle and spends lots of time with his family. 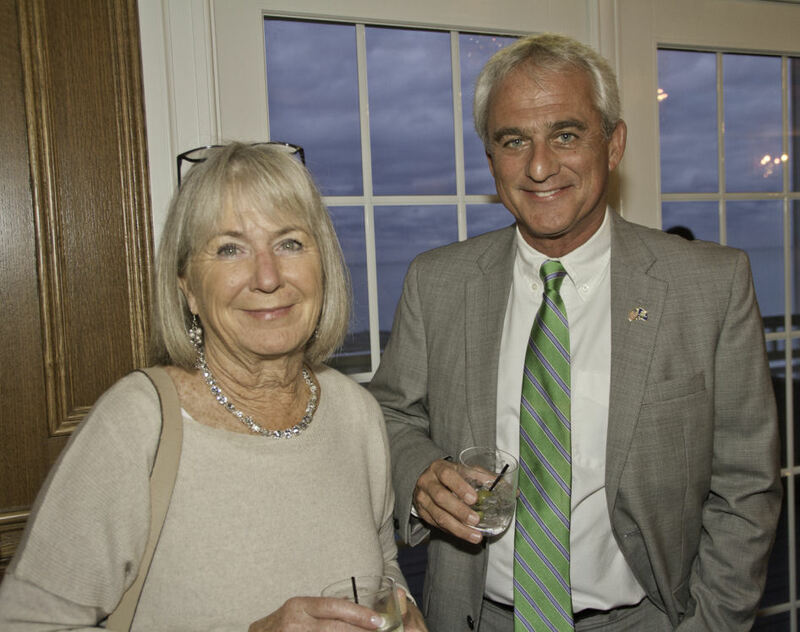 Jim's wife Connie is always supportive of his endeavors and especially of his passion for coaching. She kept the score book and immersed herself in the basketball community. Connie is here this evening to share Jim's induction along with their four children; Tracy, Jim, Nancy Lee and Heather. They also have nine grandchildren, and two great-grandchildren. 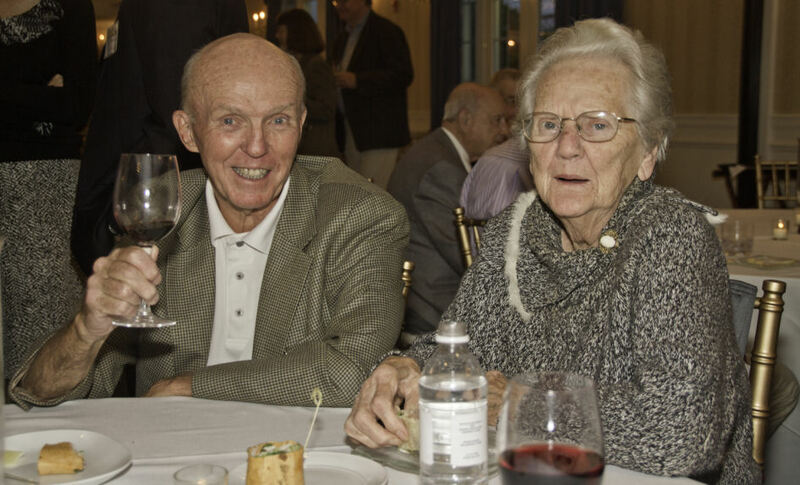 Jim's Mom and Dad were his greatest fans and were valued members of his basketball family. 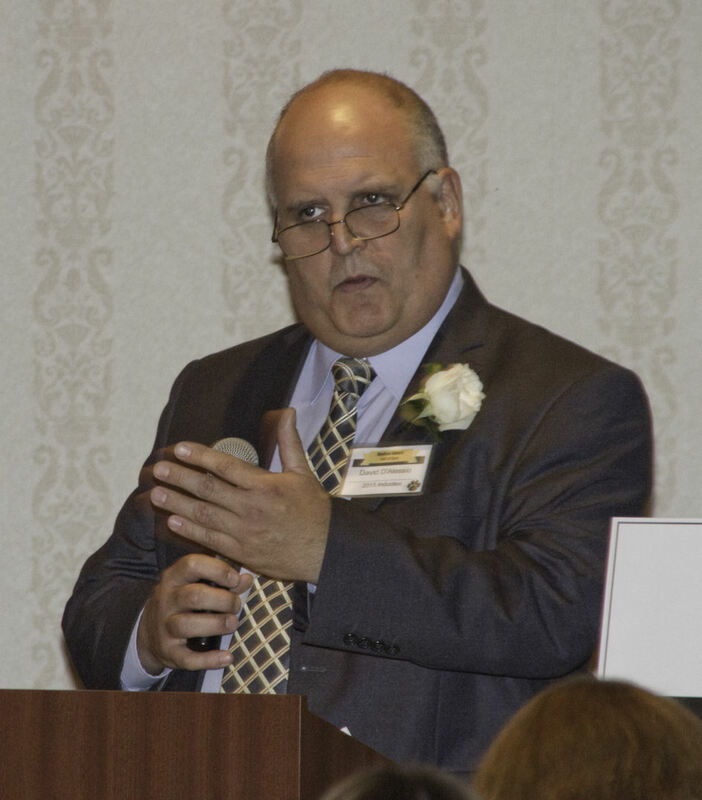 Coach Bombaci's dedication, success and demonstrated passion for Daniel Hand and the Girls' Basketball program make him deserving of induction into the Madison Athletic Hall of Fame. Some find their niche as a coach and some find their niche as a competitor. Few shine at both as did Daniel Hand wrestler and wrestling Coach Dave D'Alessio. Dave's the only one known to have won an individual class state championship, captain a state championship team and then come back to coach a state championship. 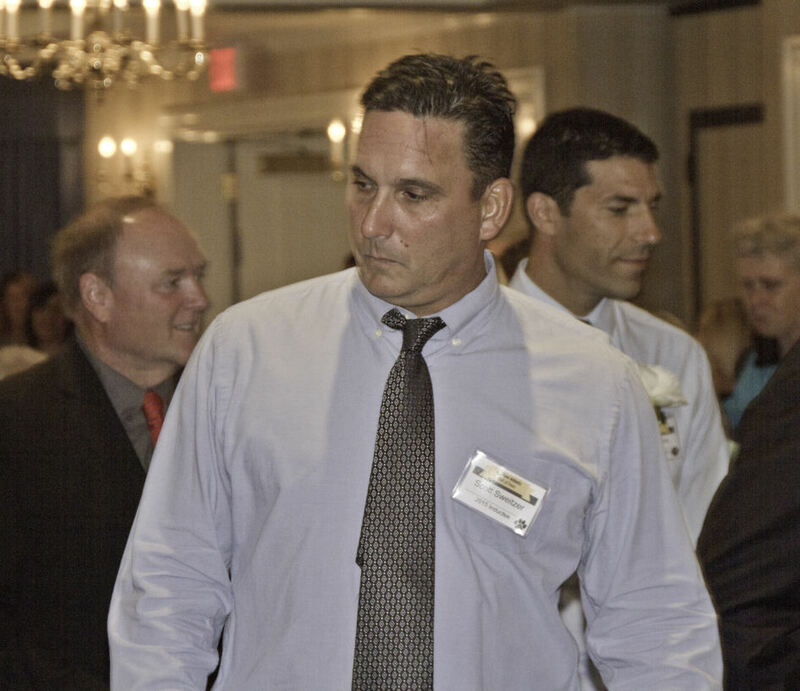 He was the CIAC Class M State Champion as a competitor while captain of the 1982 Class M State Champion team only to return to Daniel Hand as the coach and leading them to the 1995 Class M State Championship. Those accomplishments highlight his career but only tell part of his story. Dave achieved plenty leading up to that 1982 dream season. 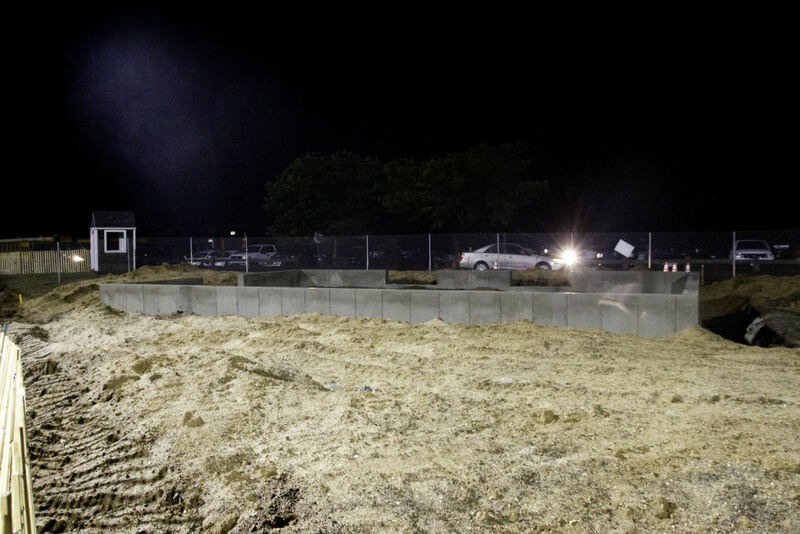 He began his climb to the top as a junior winning the Shoreline Championship. He was the Class M runner up and came in third at the State Open, repeated as Shoreline Champion, won the Class M title and again came in third at the State Open his senior year. He was Daniel Hand's first two-time State Open medalist. Dave returned to Daniel Hand as the youngest wrestling coach in Connecticut in 1987. It didn't take long to start building an impressive resume winning ten Conference Championships along with three top-three finishes in CIAC division championships (1989, 1991, and 2010) to go with the 1995 State Championship. His career record was 314-128 (ranked 14th in wins for CT wrestling coaches) and included six teams ranked in the Top Ten in Connecticut. Dave won the New Haven Register Wrestling Coach of the Year six times and was voted by his peers as CIAC Divisional Coach of the Year twice. His coaching career (1987-2010) included a host of individual successes as well. 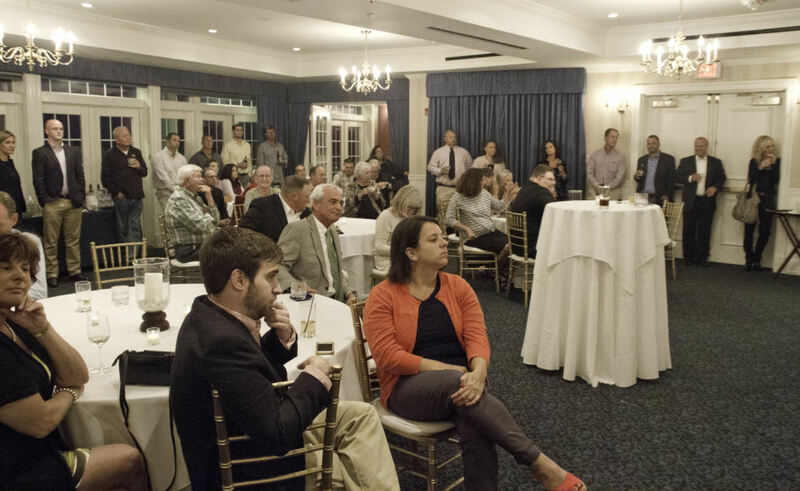 Among them: 24 State Champions, eight State Open Champions, four New England Champions, two All Americans and a Connecticut Wrestler of the Year. 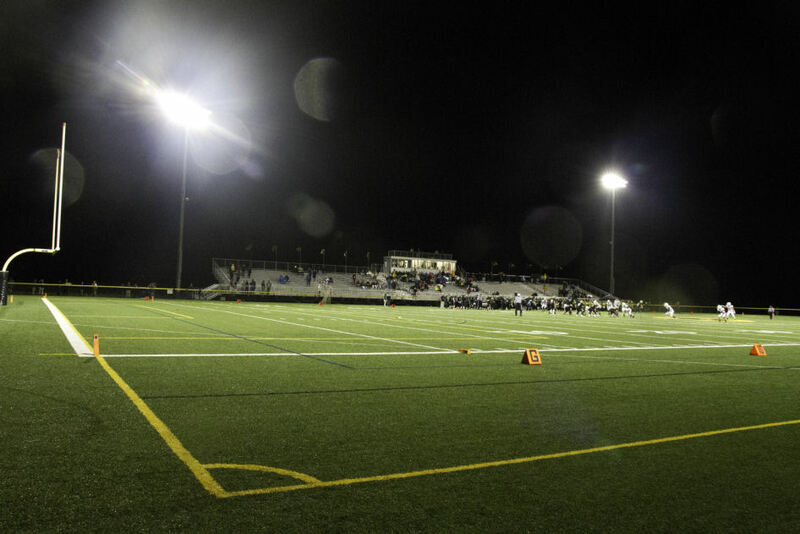 You can add over 100 Shoreline Conference and Southern Connecticut Conference individual titles to that list as well. 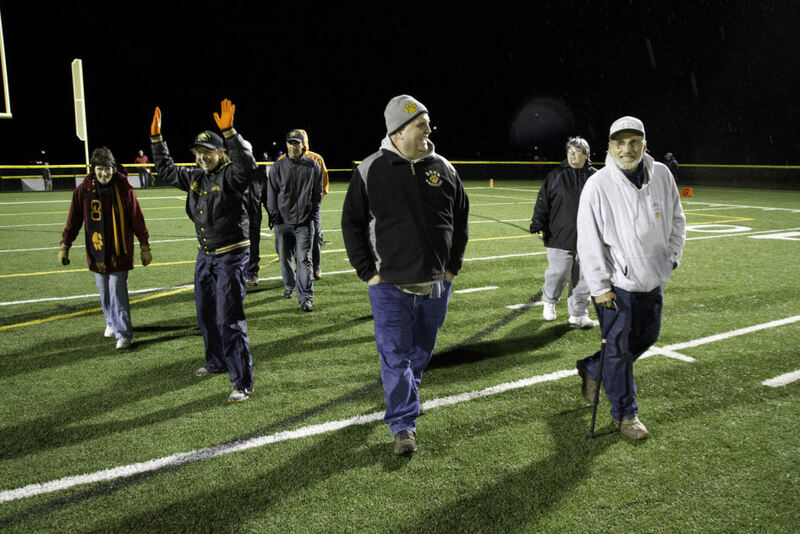 "Coach D was more than a coach to many," began Brian Arms, the Hand wrestling captain in 1998. "He was a friend, a father figure and a role model." Don Cramer, a guidance counselor at Polson Middle School, coached Dave in his senior year and said, "I admire Dave as a coach, a teacher and a friend. After all these years, what remains is a man who inspired kids to achieve on and off the mat. A man who cares for kids even if they weren't great wrestlers or great students. It is the relationships that matter to Dave. He is a man of integrity, a generous man, a giver to many throughout his career, a man that inspired me to be better." 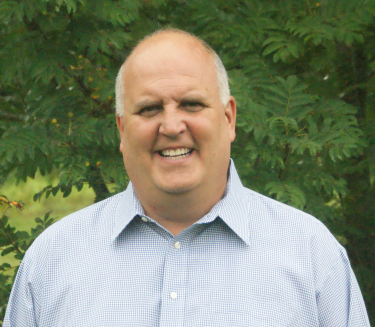 Dave has been a teacher in Madison since 1989 and left coaching to pursue his administrator's certificate. He has been serving as Madison's Middle School Science Coordinator since 2013. Dave lives in Madison with his wife Diane, son Andy (22) and daughter Hailey (12). He credits Diane for her support. 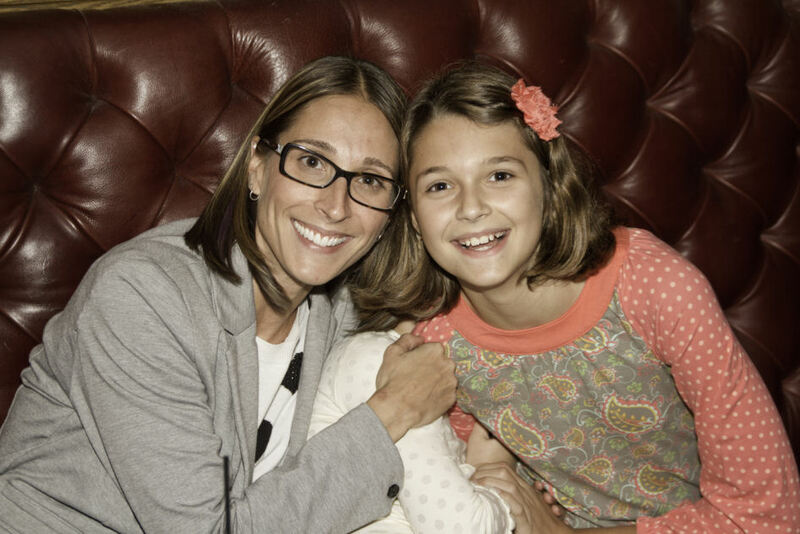 "She was always understanding with all the time demands of coaching and I'm very grateful." 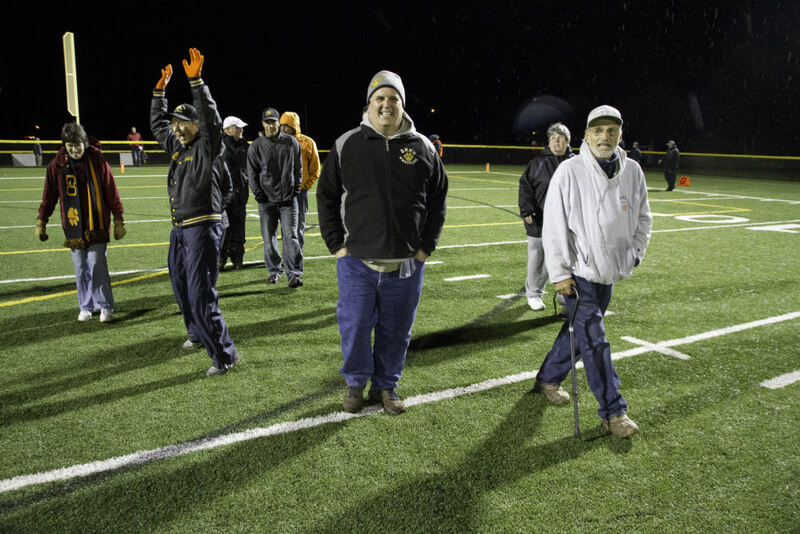 With all that success, it was coaching his son during his sophomore year that is one of his fondest memories. That along with a picture of five year old Hailey visiting at practice may define the kind of man Dave has become. Hall of fame careers are often about records and statistics. How many wins? 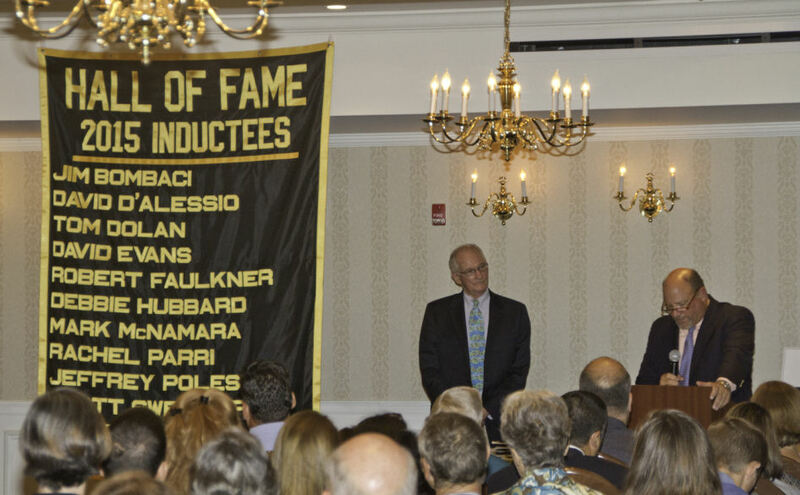 Leading hitter, leading scorer, leading this, leading that… "These achievements (records) have a place in the history of our school and in the Hall of Fame," began former field hockey head coach Gina Wygonik. She continued, "These are numbers that can be counted. But they tell only half the story of the men and women who shape the storied traditions at Daniel Hand High School. Jenn (Vuolo Brown) is one of those rare athletes whose work ethic, character and leadership made an indelible impact on the athletic program at Hand." For Brown, it was more about the intangibles like passion, selflessness and work ethic. Wygonik used an Albert Einstein quote to further make this point: "Not everything that can be counted counts, and not everything that counts can be counted." Brown was a four year starter in field hockey and likely would have been a four year starter in softball had an anterior cruciate ligament tear not sidelined her for her sophomore season. 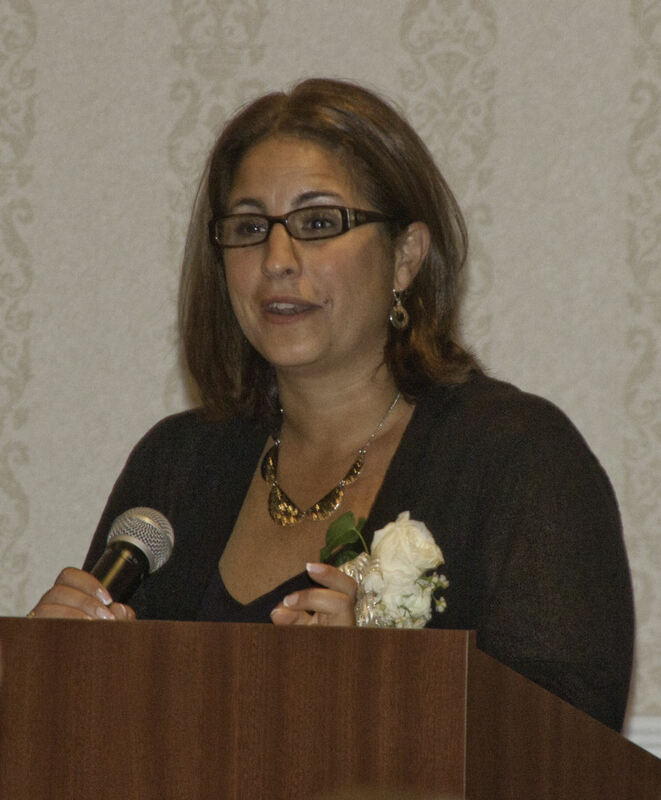 She was a two year captain in field hockey and a captain of the softball team as a senior in 1996. "I loved being with my teammates and I'm still friends with some and chat with many via social media," explains Brown. "I loved the team spirit and support Hand athletics always had. My coaches, one being my Dad in softball, taught me a lot about life, hard work and being a good teammate." She went on to play softball at the University of Hartford earning a full scholarship in her junior and senior years after half scholarships her freshmen and sophomore years. She started at second base and held the record for doubles in a season at the time and is still ranked sixth in that category 15 years later. The Hand field hockey program won the state championship this past year under head coach Sue Leckey and has been a force in the CIAC for years. "With all due respect to coach Leckey and the countless number of talented athletes that have taken this program to new heights, I believe it was special people like Jenn Vuolo who built the winning foundation," explained Wygonik. Hand softball was 69-20 over the four years of 1993-1996. Jenn started as a freshman, junior and senior and was selected to the New Haven Register All-Area and CIAC All-State as a senior. They captured the Shoreline Conference title in her freshmen year (the last year before moving to the new Southern Connecticut Conference) and won the SCC Hammonassett Division in both her junior and senior years. Ray Ezell, Hand softball coach at the time, is quoted in the New Haven Register in 1996, "Jenn's a big-time vacuum cleaner out there. You won't find a smoother player at shortstop…"
Jenn is married to Trevor Brown and now resides in Clinton with children Bailey (10) and Benjamin (6). She is a third grade teacher in the Guilford school system. 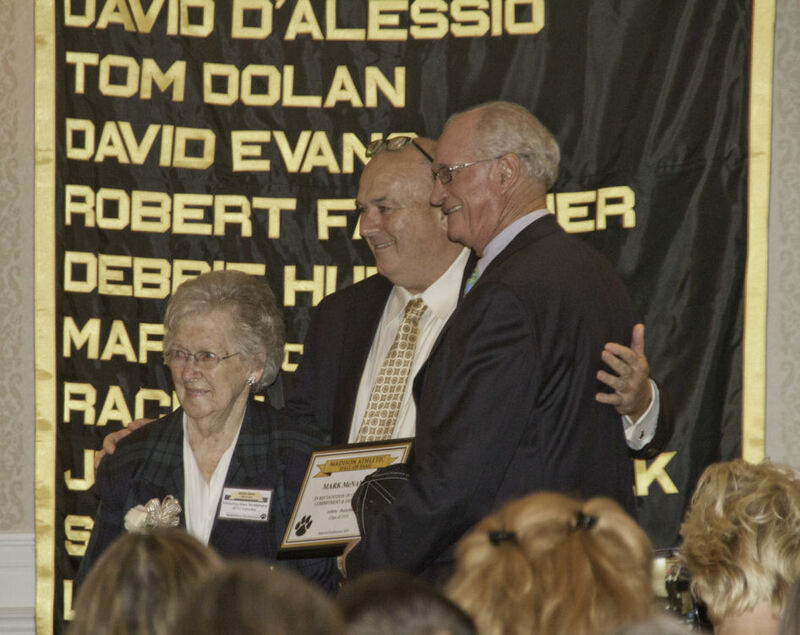 Tom Dolan has had a Hall of Fame life as a teacher, coach, volunteer, husband and father. 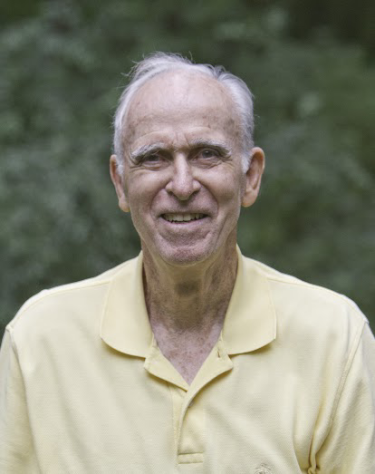 Tom graduated from Southern Connecticut University in 1958 and began teaching at Sheriden Junior High School in New Haven. He went on to teach at Hillhouse High School and coach tennis at Lee High School. In 1968, Tom came to Daniel Hand High School where he taught Physical Science and Biology until 1989. 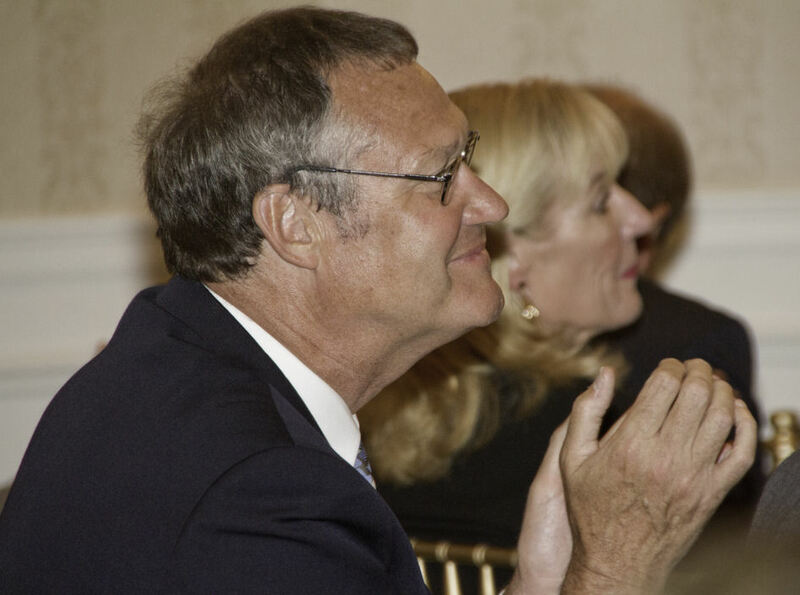 Tom has been involved in tennis since his high school years at Saint Thomas School in Bloomfield, Connecticut. Tom has won a number of Madison Town Tennis Tournaments in both singles and doubles. His Hall of Fame coaching career at Daniel Hand High School spanned twenty years. 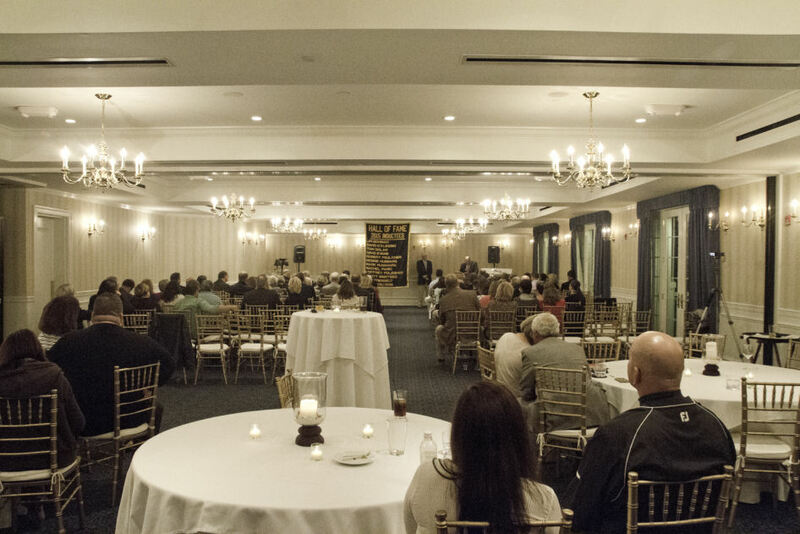 In the six years between 1978 and 1983, the tennis team won two state championships, two state runners-up, two third place finishes, and went on a seventy-two match win streak. 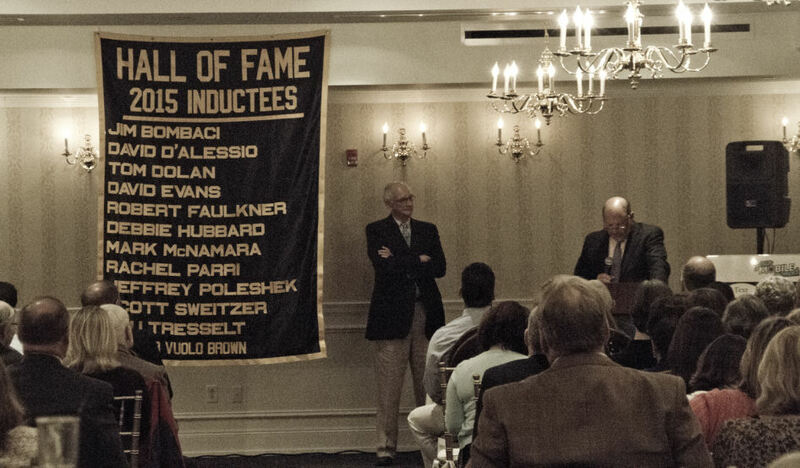 Tom was selected Connecticut Boys Tennis Coach of the Year in 1979. Former Hand player Scott Beckwith recalls "Tom Dolan was more than a coach to me. He was a teacher, coach and a friend. Tom knew how to match players together and get the most out of them. I was not the greatest player but, because of his guidance and belief in me, he was able to take a scrappy and very marginal player and his partner into the state championship. We almost made it all the way before losing to one of the powerhouse schools. 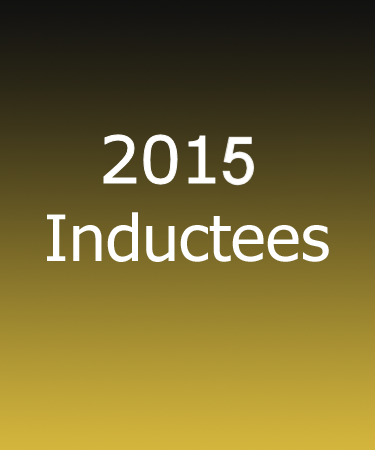 This induction is well deserved and I am proud to have the opportunity to say a few words. Congratulations Tom and thank you for being a dedicated coach teacher!" 2014 Hall of Fame Inductee Brad Ashton recalls "Tom knew how to push the right buttons to get us to individually do our best and to put the team in positions to win. He was good at managing a challenging set of personalities – giving us enough slack, but in the end, having the team ready. We had pretty good players, but our team went years without losing. I don't think that would have happened without his leadership." 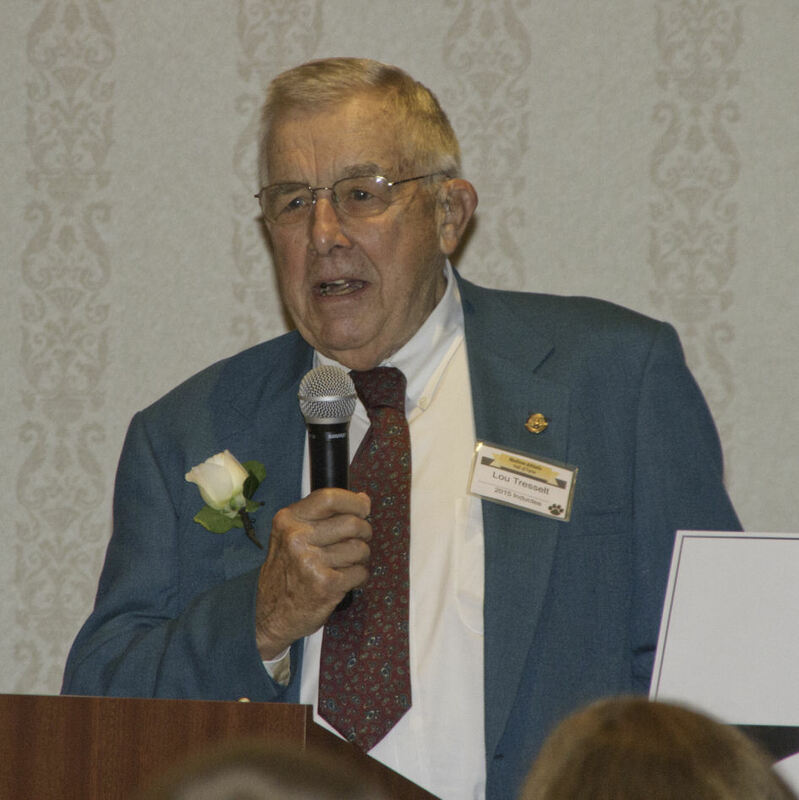 Besides coaching tennis at DHHS, Tom ran the Madison Recreation Department Tennis Program for twenty years. Tom also was an assistant girls' basketball coach at Hand for six years, and served as a basketball official for several years. After retiring from DHHS, Tom became a substitute teacher at The Morgan School in Clinton. When he learned that the girls' tennis team would be cut if they could not find a coach, he stepped in to coach them. 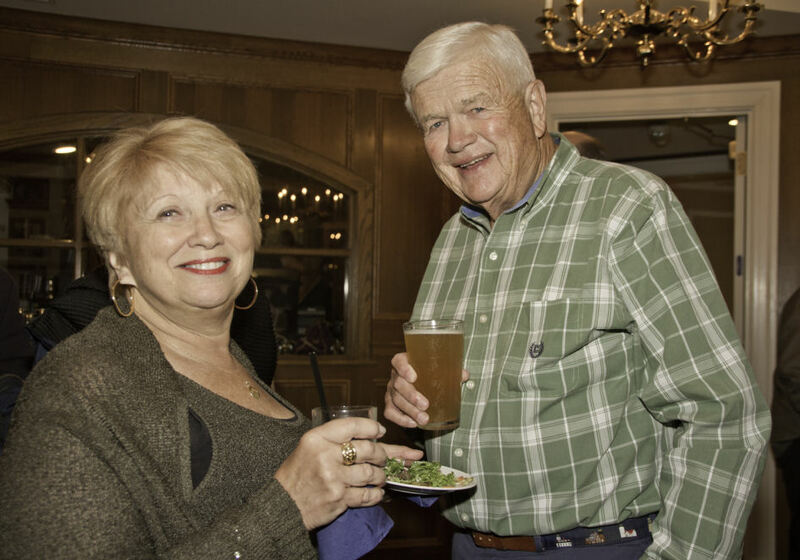 Tom has lived in Madison since 1966 with his wife of 57 years, Jeanne, and raised three children, Timothy, Margaret and Catherine who lost her life tragically in an accident caused by a drunk driver. Tom believes that the most important part of anything is having fun. 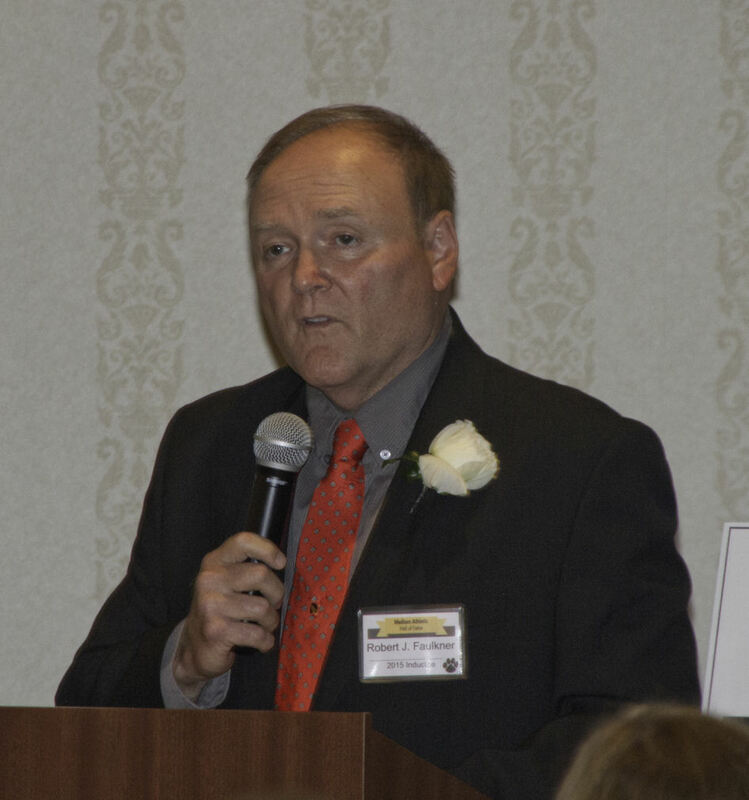 In addition to teaching and coaching, Tom spent forty years refereeing soccer at the middle school, high school, college, and Special Olympics. Tom contributed greatly in his community as a twenty four gallon blood donor. 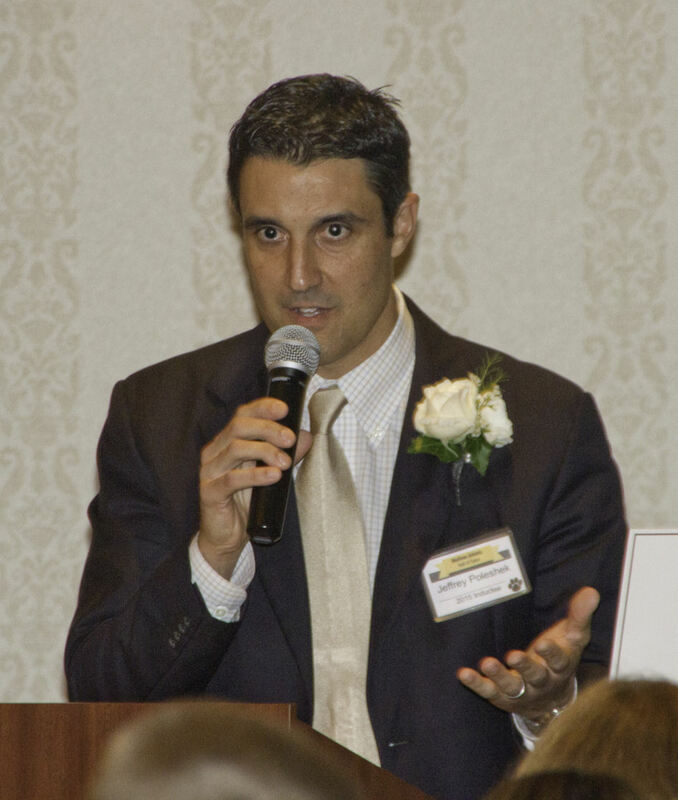 David Evans, class of 1996, was one of the most outstanding Hand soccer players in the storied history of the Hand boys' soccer program. David was a star midfielder and forward from 1993-1995, one of the golden eras of Hand boys' soccer. Hand soccer teams led by Evans and 2013 Hall of Fame inductee Andy McConville won the Class L State Soccer Championship in 1993 and 1995. During the three years Evans played varsity soccer, Hand posted a combined record of 43-4-2. 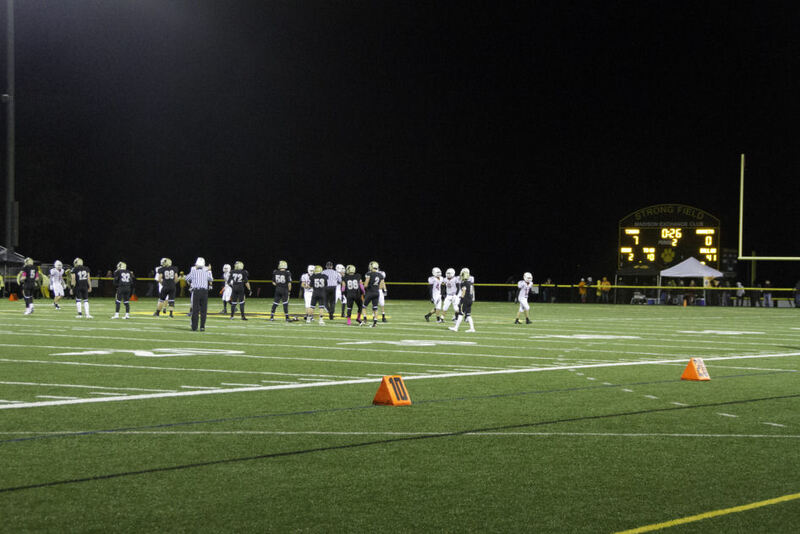 David was twice named to the All-SCC and All-Area teams and was selected to the All-State and All-New England teams. David is the second ranked soccer player in Hand history with 116 points. As a sophomore David was a starting midfielder. In a 1993 Shoreline Times article, Coach Bob Faulkner called him, "one of the most talented sophomores [he had] ever been able to work with". Evans was a key contributor on a Hand soccer team that set a school record with an 18-1 record. Hand went on to win the school's first soccer state championship in 1993. That year, the Tigers were ranked fifteenth in the nation by the National Soccer Coaches Association. In his junior season the versatile Evans was switched to the forward position. As a forward in the 1994 season Evans scored a school record twenty two goals for a 13-3-2 Hand team. 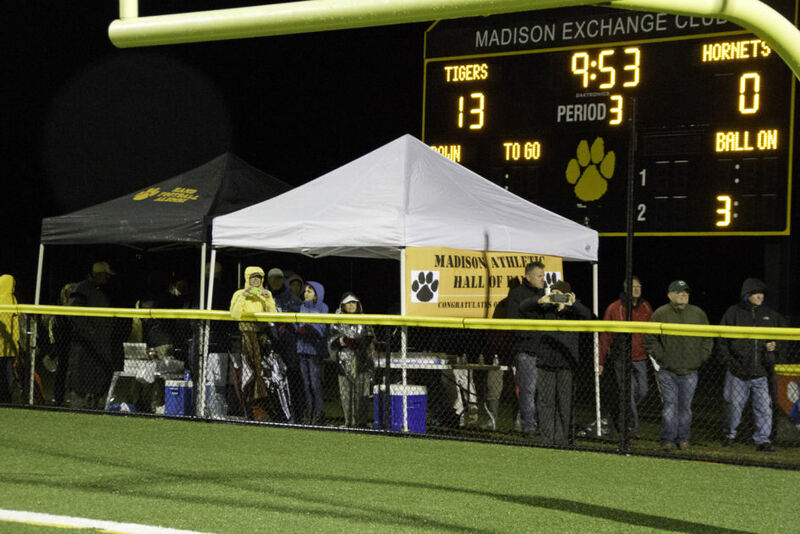 The Shoreline Times described Evans as "a runaway train in his approach to scoring a goal". David Evans and teammate McConville led Hand to their second Class L Boys Soccer Championship in three years in 1995 and a ranking of number nine in the nation in the National Soccer Coaches Poll. 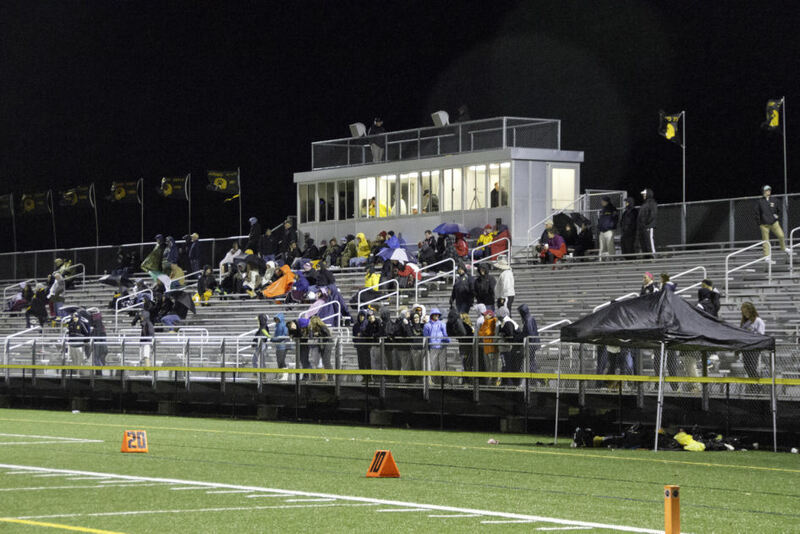 The Tigers were also the top ranked team in Connecticut in the state top ten coaches poll. On Senior Night in 1995 David concluded his regular season career by scoring four goals. 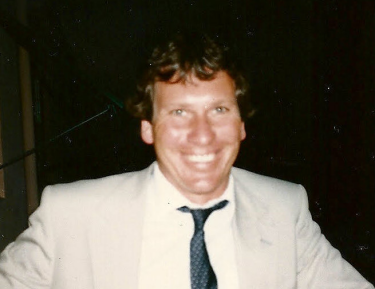 Reflecting on Evans' soccer career at Hand, his Coach Bob Faulkner stated "David Evans was one of the most dynamic goal scorers ever in the history of Daniel Hand soccer. David in his junior and senior seasons was a goal scoring machine; he was the most feared forward in the state. He not only had the ability to score goals; 38 career; he holds the team record for assists in a single season with 19 and had a team best of 40 assists for his career. There wasn't a match that David did not see two to three players marking him. He was one of the most exciting players to have ever put on a Daniel Hand uniform." Teammate Andy McConville said of Evans "David Evans was one of the best teammates and goal scorers I ever played with, on any level. When I think back on watching him play, what comes to mind first is his creativity, imagination and simply his love of playing. All these years later I can still picture the smooth style with which he played. He had quick feet and incredible ball control. He could play any position as well. In his junior year when we needed someone to play up front, he only happened to break the school record and score twenty two goals. David simply loved to play the game. He was a fantastic teammate whose love of the game could be seen whether in a state playoff game and the third session of the heat of the day in August." Following high school, David went on to play at Wentworth Institute of Technology. 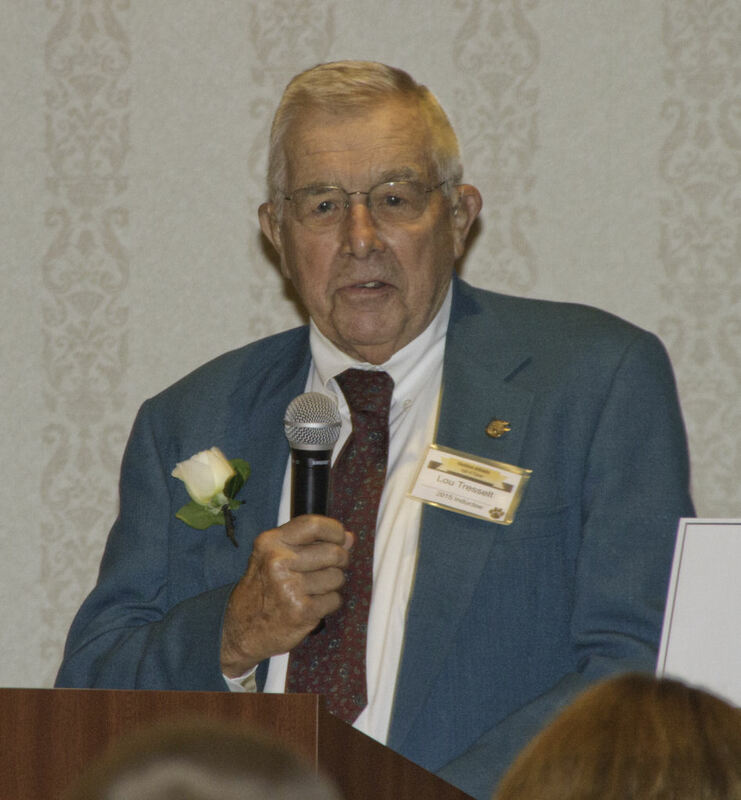 He was inducted into Wentworth's Athletic Hall of Fame in 2007. At the time of his induction David was praised as "perhaps one the greatest soccer players to don a Wentworth uniform." As a junior, David was named co-CCC Player of the Year. David was twice selected an All-New England selection and is still the men's soccer team all-time leading scorer. 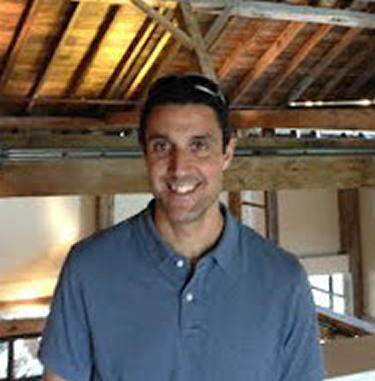 After David graduated from Wentworth with a Bachelor's degree in Civil Engineering in 2004, he was an assistant soccer coach at Wentworth for three years. He was also a four year starter with the New Hampshire Phantoms of the USL-Pro Soccer Leagues and won national championships in two other leagues. 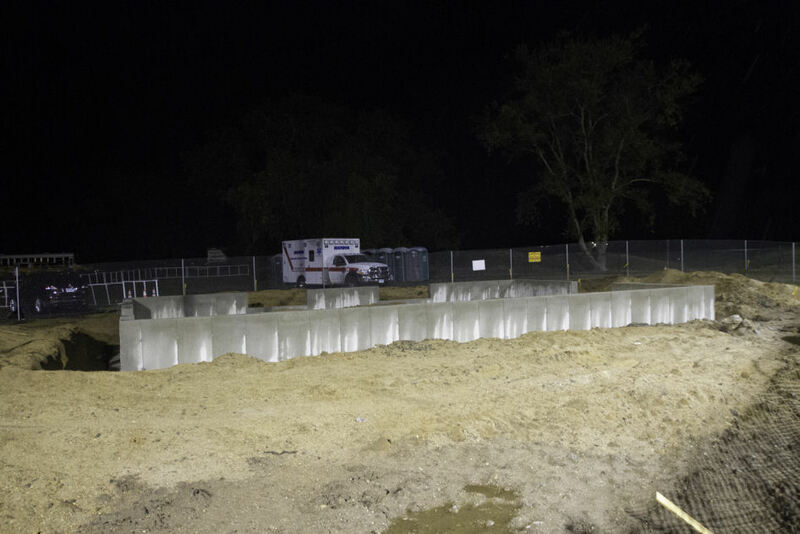 David is currently a superintendent with McCarthy Building Companies. 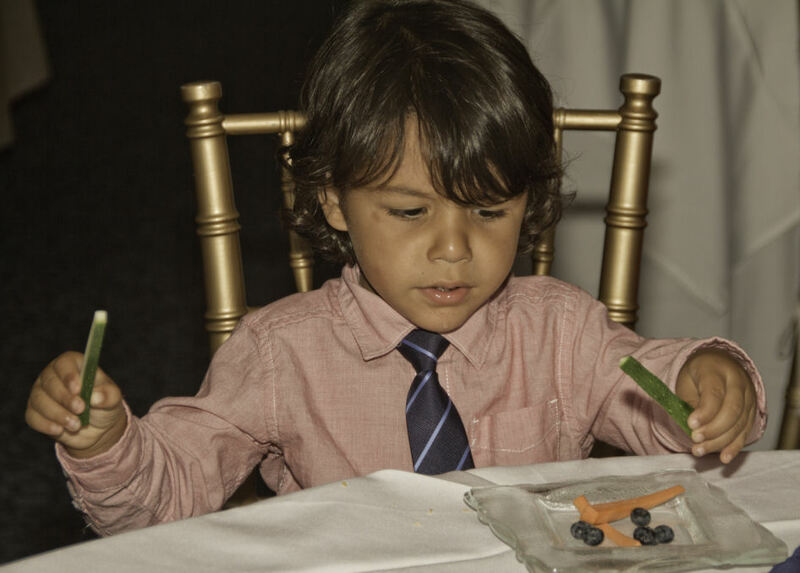 He resides with his wife Gaia and two children, Adriana (6) and Ari (3), in Carlsbad, California. 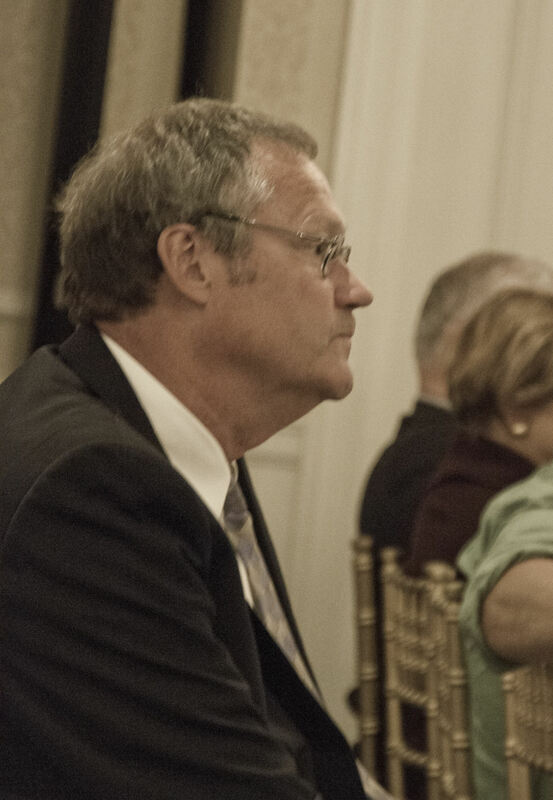 After graduating from Eastern Connecticut State University, where he was a starting goalkeeper for four years, Bob Faulkner became a highly successful soccer coach in the Guilford school system and, as an assistant coach, helped the University of New Haven reach the NCAA Division II Men's Final Four in 1984. Former Hand Parent, and Booster Club member, Bob Graham, recalls "In the late 1970's and early 1980's, Guilford was reputed to be a state soccer powerhouse. I, along with many other Madison parents, wanted to develop a Madison soccer program that might, in time, rival Guilford's program. In 1984, the DHHS athletic program was then conducting a search for a boys' varsity soccer coach. Principal Gil Cass interviewed Faulkner for the position, was impressed and hired him as the boys' soccer coach. The hiring of Coach Faulkner initiated a period of legendary success for the Hand boys' soccer program. He did so by keeping the spotlight on the players while maintaining a low profile on himself. It is time now for us to elevate that low profile and publicly compliment Coach Bob for his twenty-six years of outstanding accomplishments." Coach Faulkner quickly improved the performance of the Hand soccer team while coaching the boys' team from 1985 to 1999. In 1987, Faulkner's third season, Hand won their first Shoreline Soccer Championship ever with a 9-0 record. Hand reached the pinnacle of success in 1993 when the boys won the school's first state soccer championship. Hand was ranked fifteenth in the nation. Additional Class L State Championships followed in 1995 and 1997. The "95" team was ranked first in Connecticut and ninth in the nation. The 1999 team were state finalists, Coach Faulkner's fourth state finalists in seven years. Coach Faulkner's boys' team were ranked in the top ten in the state fourteen out of fifteen years. 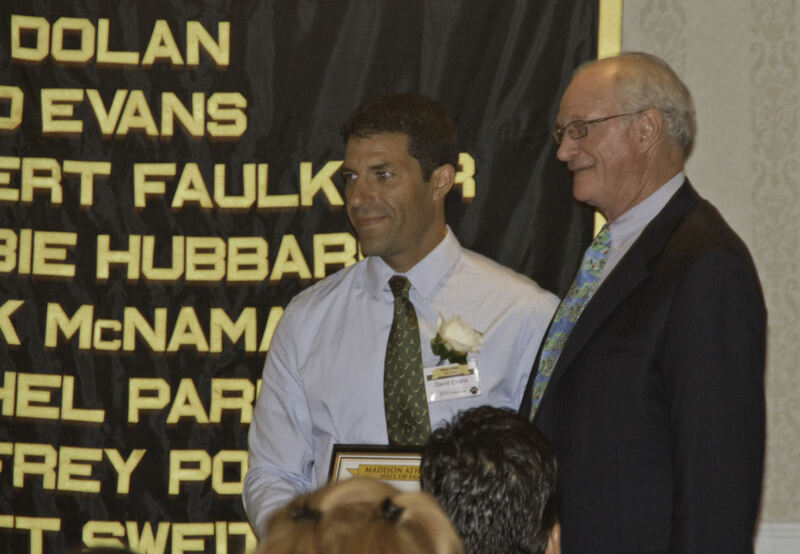 In recalling his years playing for Coach Faulkner, 2013 Hall of Fame inductee Andrew McConville, stated "I cannot think about Hand soccer without Coach Faulkner immediately coming to mind. He put the boys program on the map and then continued to achieve with the girls program. Coach's success, year in and year out, came from his love of the game and desire to teach his players. As a young player coming in, you knew the high bar of success that was set and the atmosphere coach created to continue building on that, and you wanted to be a part of the next step." One of Andrew's special memories of playing for Coach Faulkner was being reminded by his coach of what it meant to play under the lights at Strong Field. Coach Faulkner began the second stage of his Hand coaching career from 2000-2010 when he coached the girls' varsity soccer program. As girls' coach, Coach Faulkner's teams continued to experience great success. The girls' team advanced to the state finals in 2001, 2004 and 2006. In addition, the girls' team won the Southern Connecticut Conference Championship seven out of the eleven years Bob coached them. Former Hand player, and current Trinity College Junior and third year starting varsity player, Kendra Lena said of Coach Faulkner "There could not be a more deserving inductee into the Madison Athletic Hall of Fame than Coach Robert Faulkner. He lived for the game, for the coaching and for us girls. He lessened the athletic gap between genders with coed scrimmages, practices and fitness sessions. His coaching style, without a doubt, heightened the mental and physical durability of us young women. 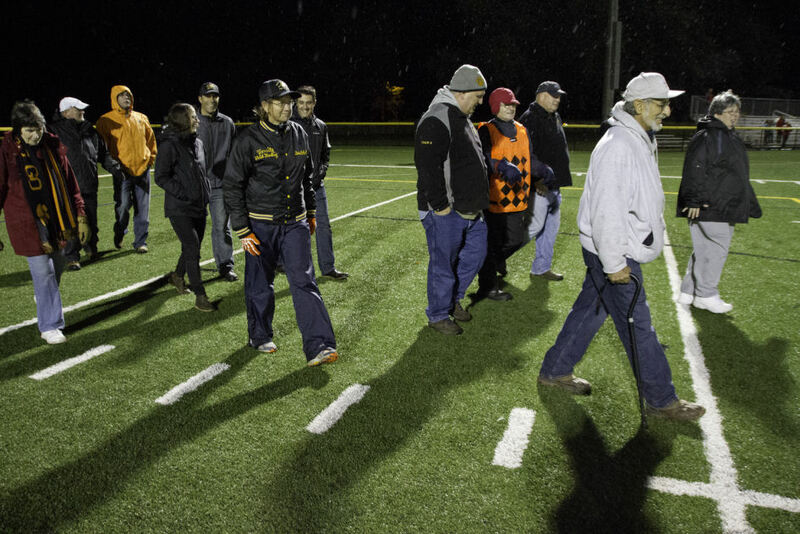 It's not every day you have a coach with such intense dedication to his high school team. I undeniably accredit my success at the collegiate level to my former Coach Faulkner. He will forever be one of my favorite soccer coaches." Coach Faulkner has been honored with over twenty major awards for his coaching success during his distinguished career. 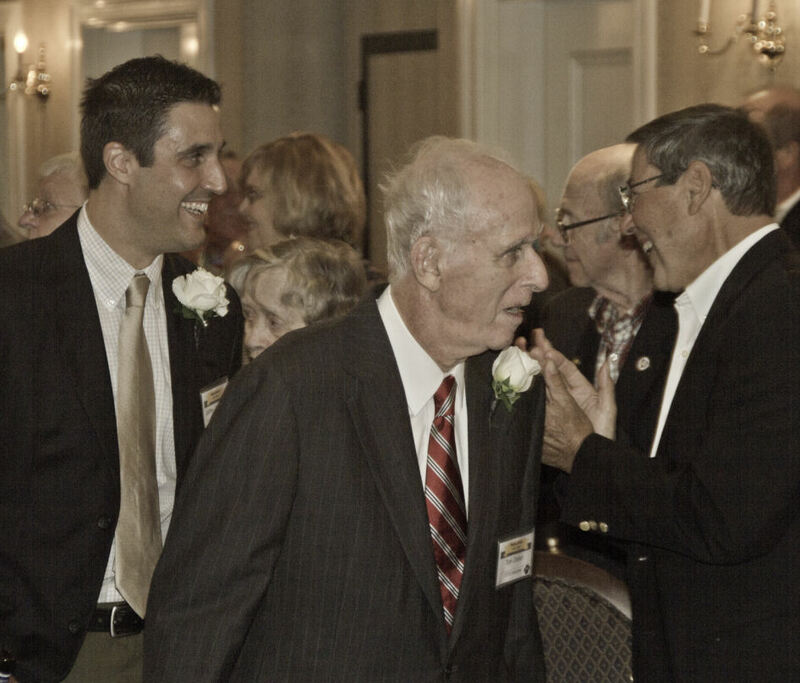 In 1995-96 the Connecticut Sports Writers Association honored Coach Faulkner with the Doc McInerney Male Sports Coach of the Year Award in all sports for the State of Connecticut. 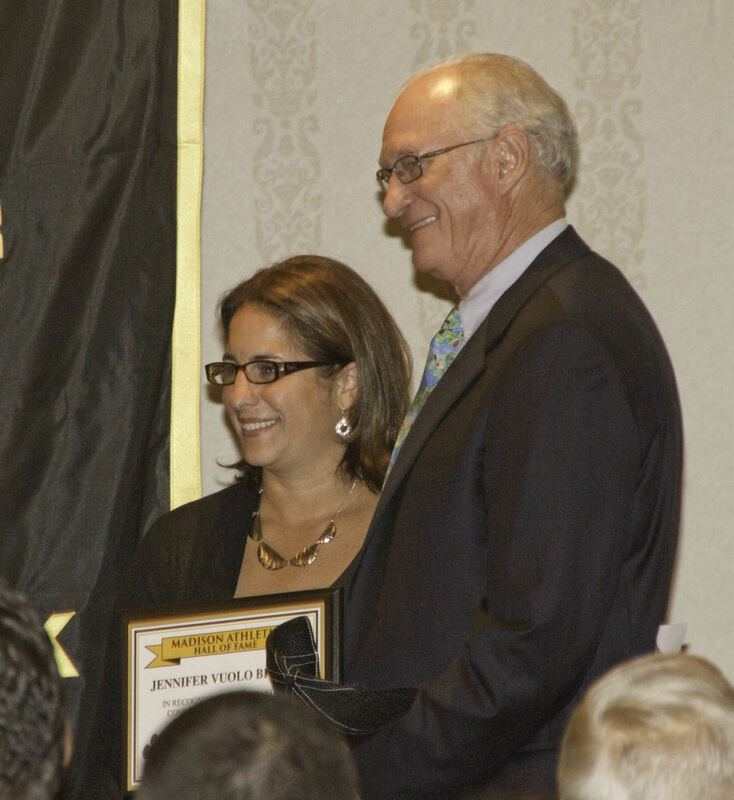 The McInerney Award is Connecticut's top high school coaching award. 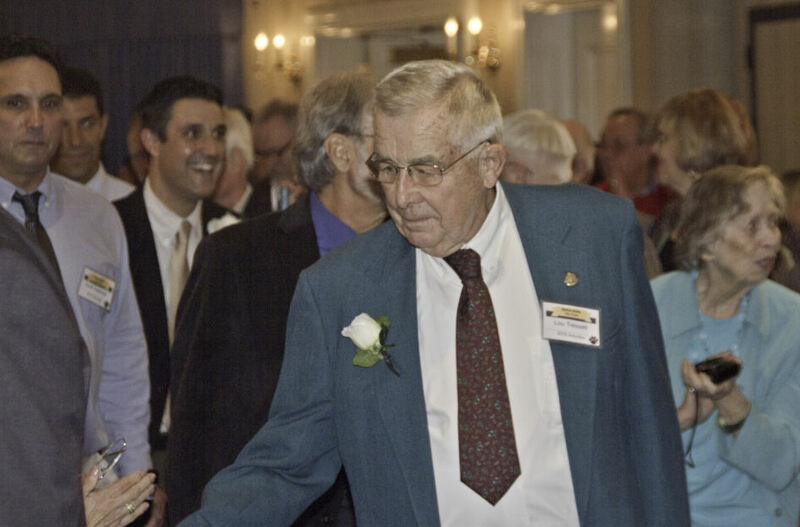 That same year, Coach Faulkner was honored at the Connecticut General Assembly. 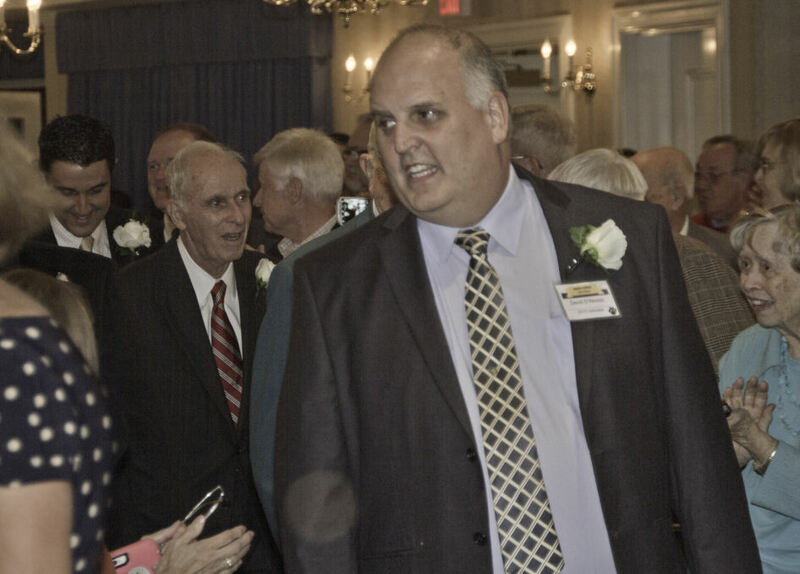 Bob was formally recognized by the state legislature and was presented a citation as one of Connecticut's top coaches. 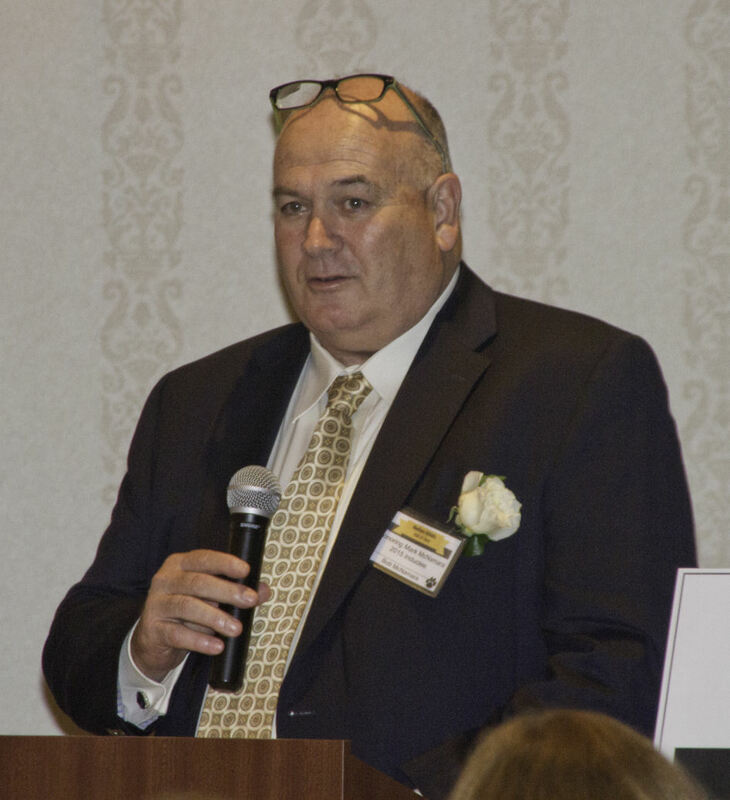 Perhaps most significantly, in 2015 Bob received the Lifetime Member Award from the Connecticut Soccer Coaches Association, only the fourteenth such honoree in the thirty nine year history of the organization. Coach Faulkner's teams have never failed to qualify for the state tournament or had a losing record. His career record for boys and girls combined is 359-105-29. As significant as all the championships and awards are, Bob Faulkner's Hall of Fame legacy as Hand soccer coach is far more than a remarkable winning percentage. Bob taught his players values and lifelong lessons they have applied to their lives, far beyond the soccer field, such as to believe in themselves and their ability to do more than they thought they could. 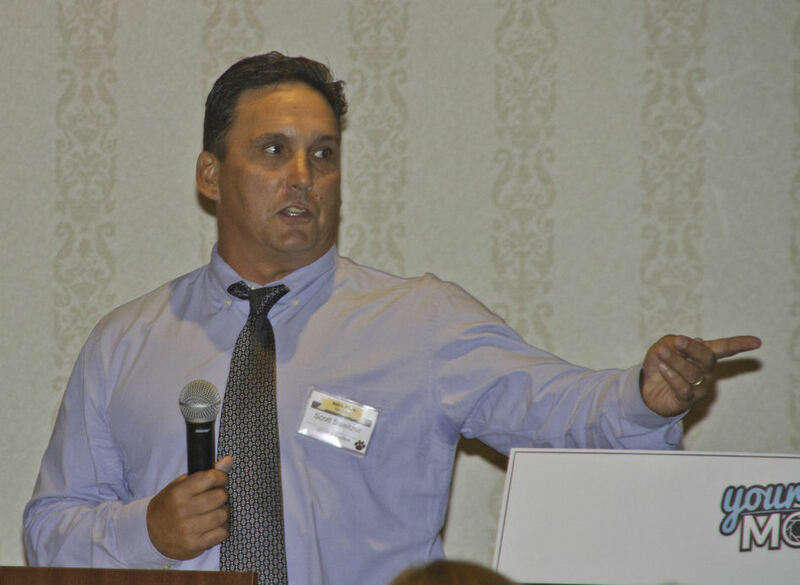 Coach Faulkner's athletes grew physically and emotionally, not only because he had high expectations for them, but also because he had the wisdom to help his players to achieve his expectations by building their self-esteem. As a result of the high standards Coach Faulkner set for his athletes, they soon refused to accept mediocrity in effort, attitude or performance. Bob always looked for opportunities to use his position as a highly respected coach to teach his players' life lessons such as mastering hardships, responding to success, rebounding from failure, trusting in one's teammates and sacrificing individual needs and fame for the benefit of the group. Coach Faulkner continually modeled the attitudes and behaviors, such as self-control, that he wanted his players to adopt. Coach Bob Faulkner truly believed that what he was teaching would have an impact on his students and players far beyond the game of soccer. 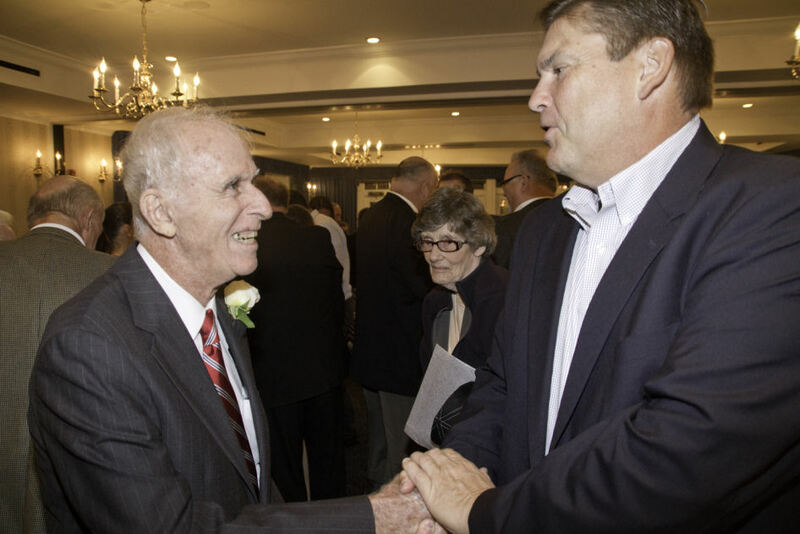 Veteran coach Joe Tenczar reflected on his forty year coaching relationship with Coach Faulkner by saying "Through all these years I have had the highest respect for Robert Faulkner as ‘the man" and the coach. He lives an ethical life based on character traits such as integrity, respect, justice and compassion. One could not have a better coach or friend than Bob." 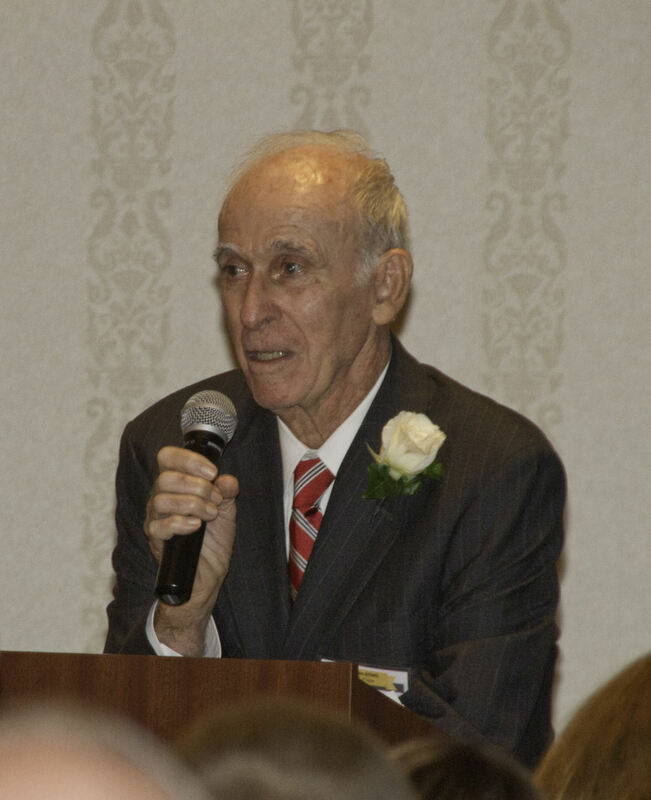 Coach Bob Faulkner has lived in Guilford for the last fifty nine years and was inducted into Guilford's Athletic Hall of Fame in the 2007-08 school year. 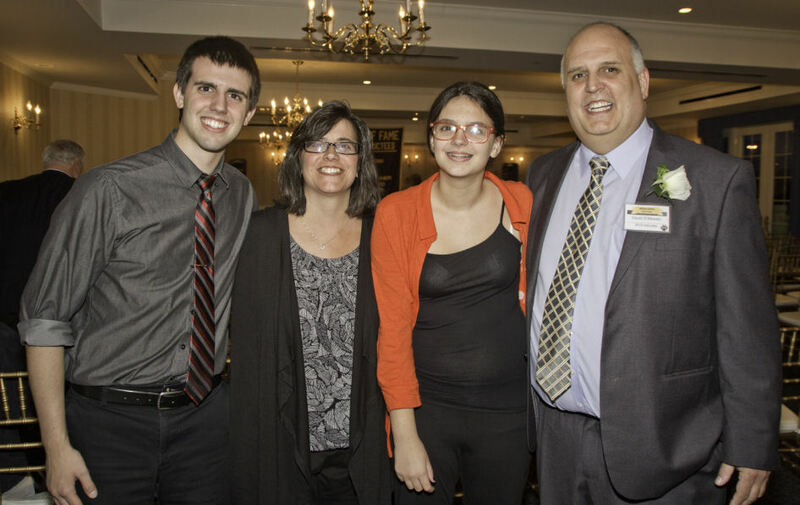 Bob is currently an assistant boys' soccer coach at Branford High School where he helped the Hornets win their first ever Class L State Championship in 2014. Bob has been employed as the In-School Suspension Monitor at Hand since 1985. Deborah (Deb) Hubbard graduated from Daniel Hand in 1979. She was a three sport role model who earned 12 Varsity letters in her outstanding career as a Hand Tiger. Deb was accomplished academically as an honors student, athletically as an exceptional multi-sport participant, and as a student leader, captaining two of three sports in her senior year. She wore #41 on the courts and fields of Daniel Hand, earning All-Shoreline and All-State recognition in Field Hockey as well as All Shoreline recognition in Softball and Basketball. She earned All-Shoreline and All-state recognition in Field Hockey as well as All-Shoreline recognition in Softball and Basketball. Deb's athleticism and consistent contribution to women's athletics was exceptional throughout her four years at Daniel Hand. Deb began her time at Daniel Hand in "stand out" fashion as she earned Varsity letters in three sports during her freshman year. She played Basketball and Softball for Willie Roze and Field Hockey for Pat Shonk. 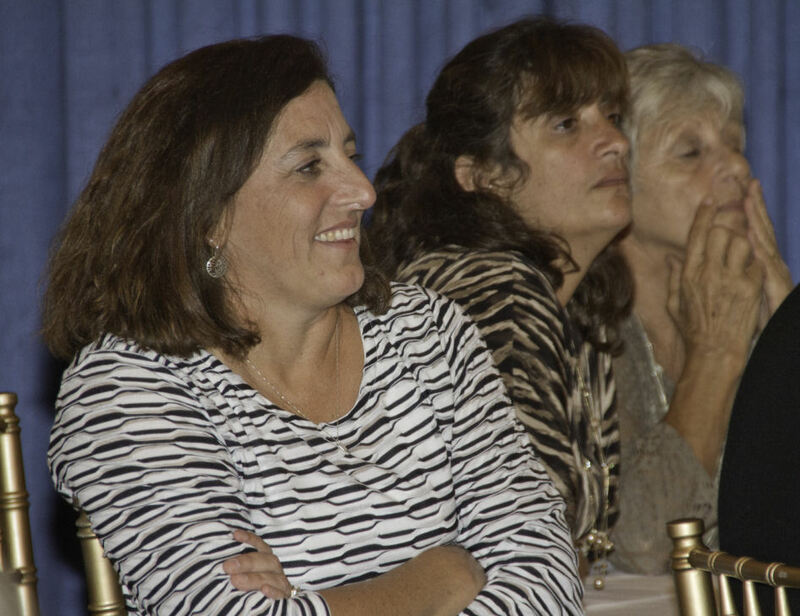 Deb was a member of the 1978 Shoreline Championship Field Hockey Team where she led her team from the Halfback position as the team's Most Valuable Player. 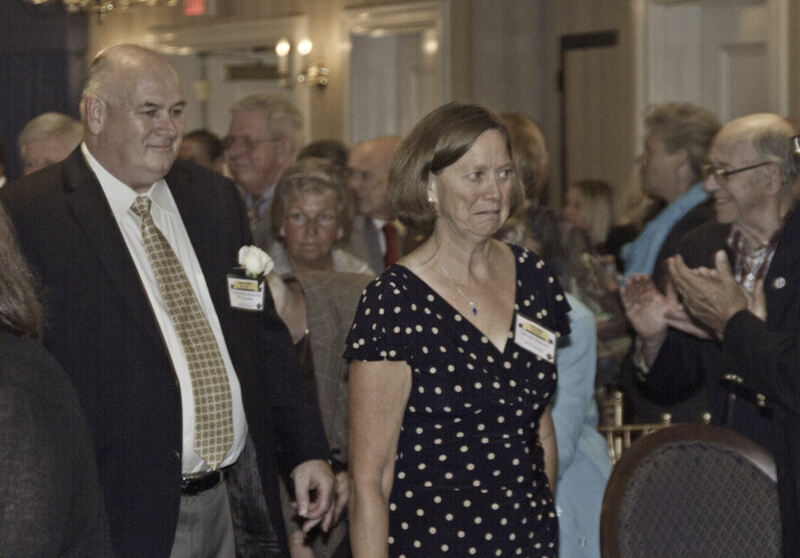 She Co-captained Field Hockey in her fourth season, as a Varsity starter in 1978, earning All-Shoreline and All-State recognition for the Championship season in her senior year. In Basketball, Deb was also highly accomplished and a "team player". She continued her senior year in championship fashion by helping to lead the team to a 15-3 regular season record. Deb was regularly the team's leading scorer, and was often relied on for clutch shooting, including her game winning shot over Guilford to secure the victory over Hand's greatest rival. Her performances earned her All-shoreline recognition as well as the team's MVP designation. 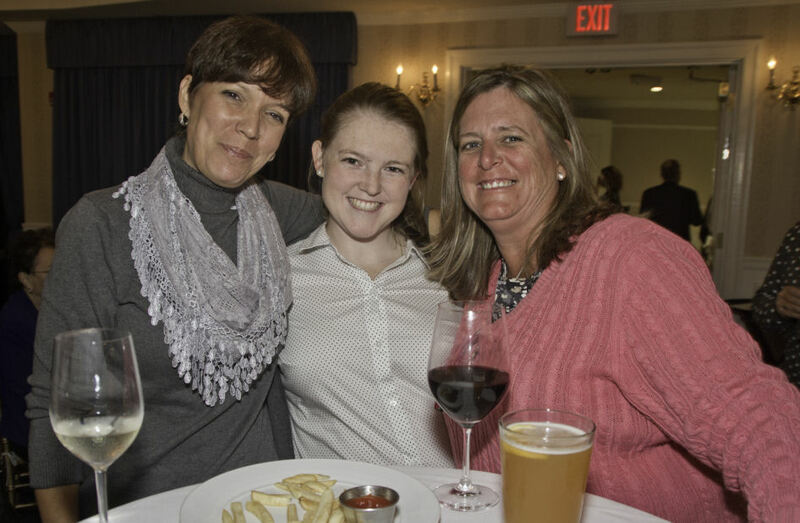 Deb maintained high standards in the classroom while competing and was recognized by the New Haven Tap-Off Club as a Scholar Athlete. In the Spring season, Deb pitched for the softball team. Her presence on the mound was formidable. As Co-captain she helped lead the softball team to a Shoreline Championship over Coginchaug and a 2nd place finish in the State Championship. She was the winning pitcher in the League Championship game and garnered team Most Valuable Player recognition for the third sports season MVP award in her senior year. Deb was a role model on and off the field of competition and is remembered as one of the strongest and most accomplished multi-sport athletes to compete in a Daniel Hand uniform. 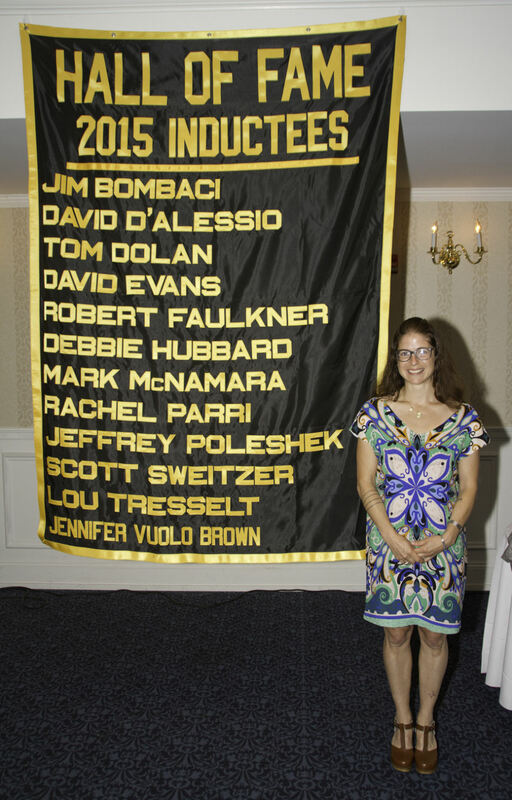 In 1978-79, Deb was recognized by the Madison Lion's Club as the Student Athlete of the Year. Teacher and Coach Vicki Crompton shared her respect for Deb; "More than just a skilled athlete, Deb is an exceptional human being. Sensitive and concerned for others, she was the epitome of the "team player". As a leader, Deb consistently worked hard, was respectful and respected, and led by example. She was an active member of the Girls' Athletic Association (GAA) for which she served as an officer her sophomore year." After graduating from Daniel Hand, Deb pursued her B.S. in Physical Therapy from Ithaca College where she continued to be a student athlete, competing and earning varsity letters in both basketball and crew. She graduated from Ithaca in 1983. Later, she continued her studies at the University of St. Augustine where she earned her Doctorate in Physical Therapy. 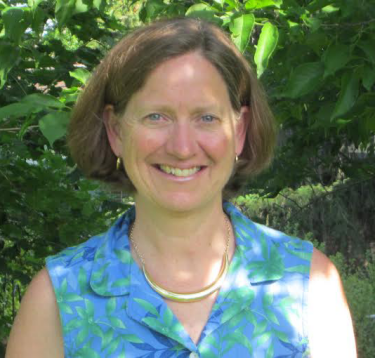 Residing in Colorado since 1983, Deb continued to play competitive softball and club field hockey and is most recently an avid cyclist and a downhill skier. Deb is a Physical Therapist at the Spalding Rehabilitation Hospital for neurologically impaired and she also works for an outpatient clinic that specializes in Manual Therapy, Orthopedics and Dry Needling. She resides in Lakewood, Colorado with her wife Tammy and their black lab, Tucker. Deb is the daughter of John and Barbara Hubbard. 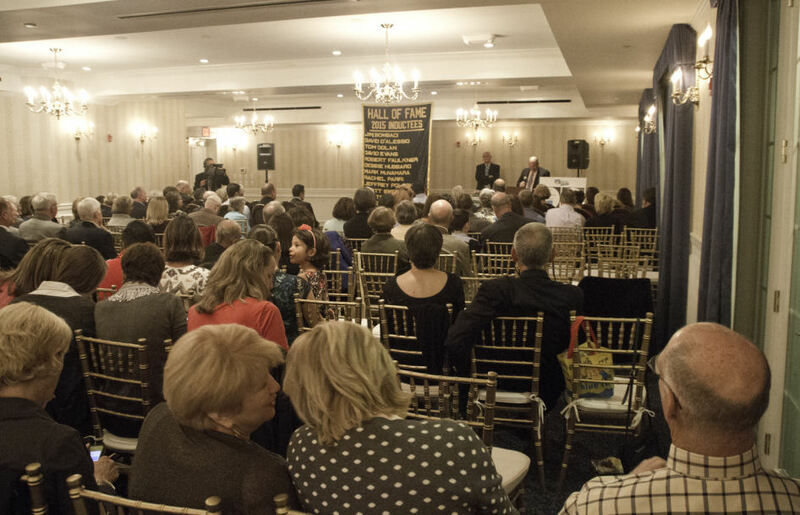 The Daniel Hand High School Hall of Fame is honored to induct, posthumously, from the Class of 1974, Mark McNamara. "Mac" as his friends and teammates affectionately called him will be remembered as one of the best basketball players in the storied program's history. 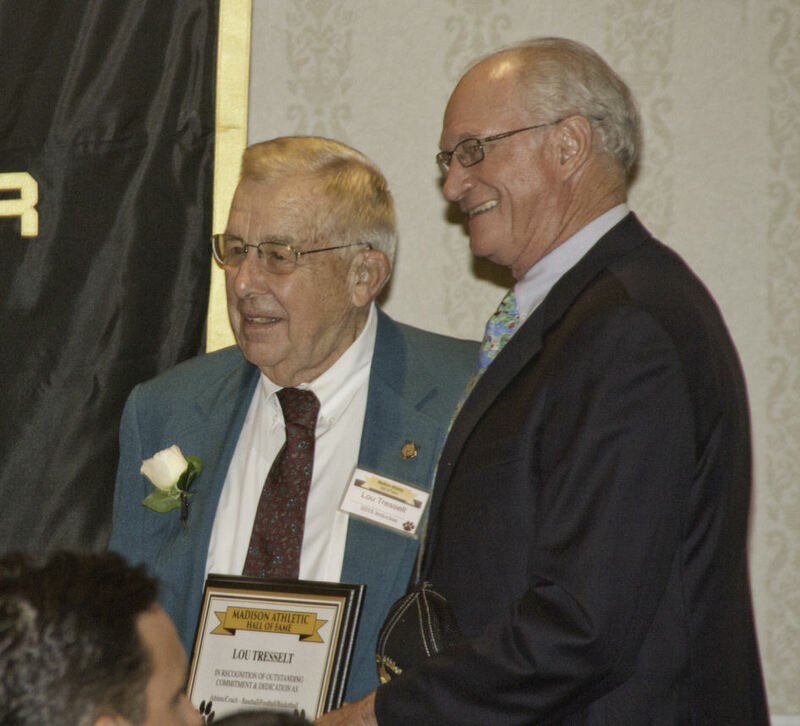 Mac was bestowed many honors throughout his career. During his senior year Mark was selected to the Coaches Association Class M All State Team along with being selected to the New Haven Register All State 2nd Team. He was elected a member of the 1974 Prep All American Basketball Honors Program, on the basis of his outstanding athletic performance. The New Haven Tap Off Club selected Mac to the All County M&S Team and also earned a spot on the All Xavier Holiday Tournament Team. Mark was selected to the All Shoreline teams in both his Junior & Senior year. Mark was also given the rare honor of being voted Captain in both his junior and senior year. Mac had numerous highlights throughout his career at Hand. In his sophomore year, Mac contributed key minutes off Bill Barker's bench in a historic win defeating Cromwell and ending the Panthers 54 Game winning streak. Mac also started 3 Shoreline Championship games against Guilford, at possibly the high point of their great rivalry, finally winning his senior year 59-43. Hand's leading scorer and rebounder in both his Junior and Senior years he would close his career out with a historic Class M championship game against St. Paul of Bristol. In front of a crowd of 7,000 and Channel 8 television, Mac and his teammates would eventually lose in overtime to St Paul, 71-70. Mark ended the night with 22 points shooting an impressive 50% from the floor. Legendary Hand coach Bill Barker fondly remembered Mac "as one of the most appreciative players I had the honor of coaching. He cherished his basketball experience at DHHS. He was a terrific player and valued friend." Before his untimely death in Sept 2014, Mark owned a very successful painting company in Madison for the past 25 years. 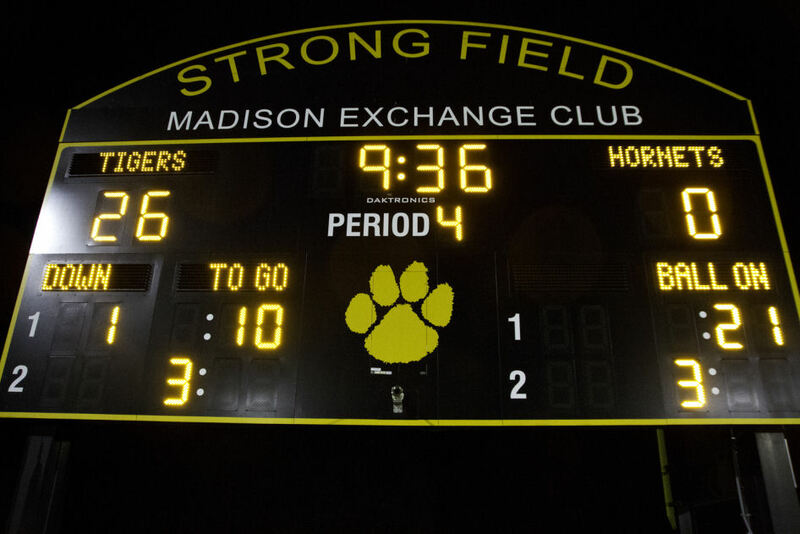 Mac truly loved the Town of Madison and was an avid sports fan of Hand High school athletics. He was a permanent fixture in the stands on Friday nights at the Surf Club and gleamed with pride as an alumnus of this great school. Mac made donations to Bill Barker's Hoop Dreams and also was an avid supporter towards the development of the Strong Field Center. He is truly missed by his family and friends and it would have been the honor of his life to be nominated into this year's Hall of Fame class. 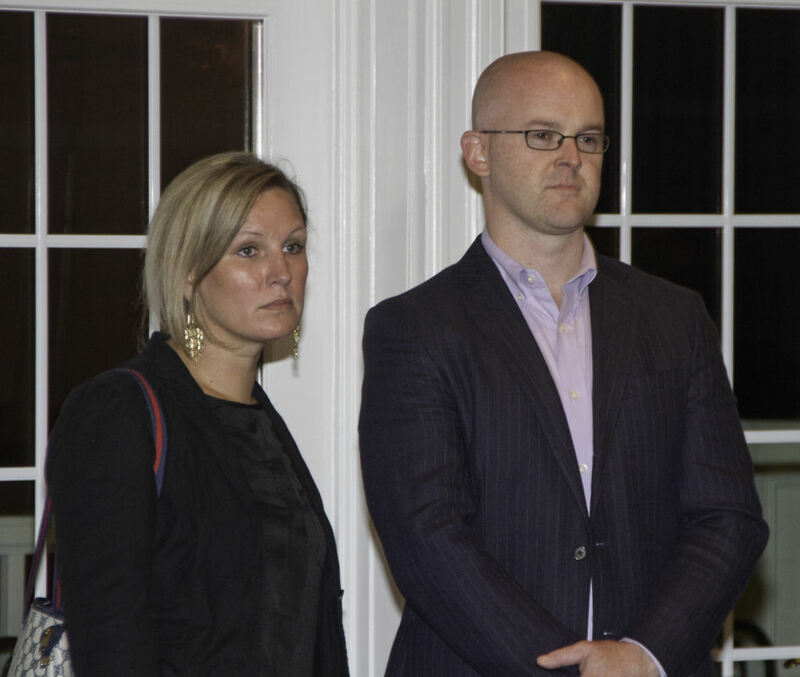 Accepting in honor of Mark is his mother Madeleine and his older brother and Daniel Hand alumnus, Bob McNamara. 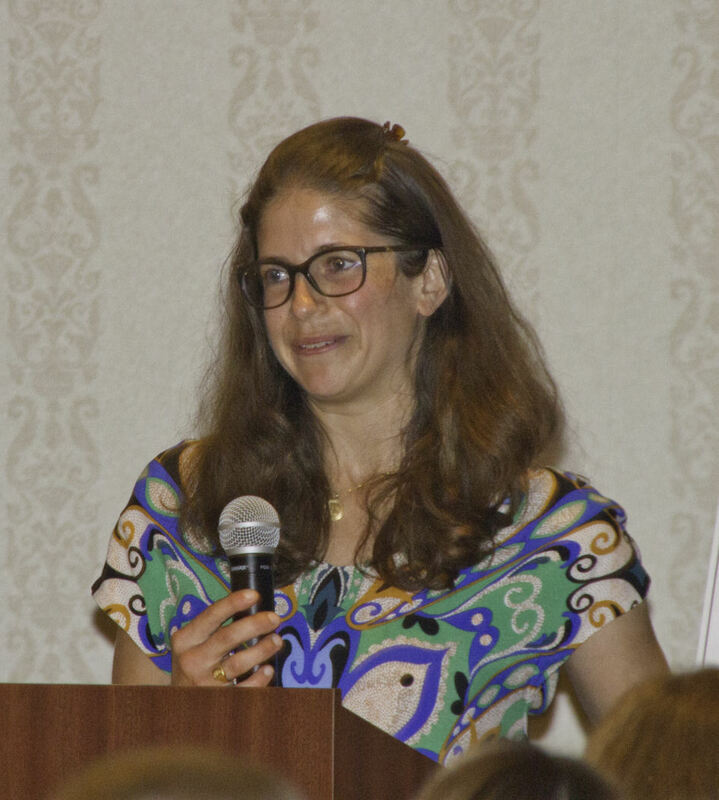 Rachel Parri, Class of 1998, was the recipient of the highest award a female soccer player can achieve in the State of Connecticut, namely the CJSA 1997 "Female Player of the Year"! John Hancock once stated: "When completing any work always autograph that work with your signature of excellence". Unlike the commercial slogan by the Nike Corporation of "Just Do It", Rachel Parri believed that her signature of excellence wasn't to "Just Do It" but to the contrary, Rachel had to do it to the point of perfection and beyond the level of excellence! Rachel Parri was the poster child of every coaches' dream! She is to date, the greatest and most highly decorated female soccer player ever to step out onto the field as a four-year varsity starter. Robert Faulkner, Head Coach of both the Boy's and Girls' Soccer Teams during the last three decades considers Rachel the premier girls' player of all- time at Hand High School and in a league of her own." Rachel Parri's accomplishments reads like a Hollywood movie script! Her reputation as a complete athlete is legendary for she brought incredible athletic talents to both her high school as well as to her college teams. Former DHHS Head Boys' Soccer Coach Joe Tenczar, and later First Assistant Coach to the Girls' Soccer Program under Coach David Scott, recalled one particular night at Strong Field where Rachel's talents could not be denied. 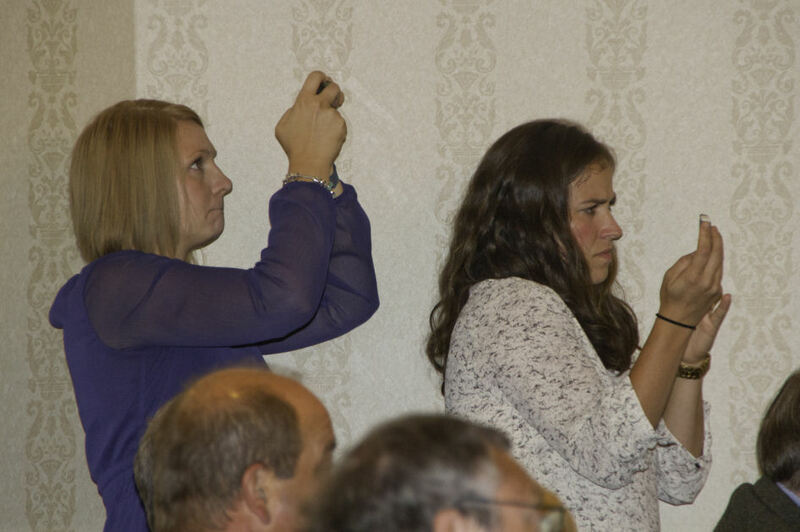 "That night, I stepped out of the coach's box to shoot some needed video for our upcoming soccer banquet. I positioned myself on the sideline deep in our offensive zone. The opposing team was making a strong surge in our defensive zone at the other end of the field. Most of Hand's players were packed in tightly marking individual players. Then it happened! Our sweeperback gained possession of the ball near the goal line and chipped a lofting ball out of the goal area. Rachel with her incredible speed, checked off her guarded player and sprints towards the ball stealing it away from the feet of an opponent. Ball now at her feet and her teammates trailing behind, Rachel begins her solo dash towards goal, beating another defender and then a third player. She continued down field faking to her left then right, sprinting in fifth gear overdrive past the midfielder. A very fast and physical sweeperback came up from behind Rachel to confront her outside the eighteen. The defender ran shoulder to shoulder with Rachel, trying to push Rachel off her feet. The goalie also come out trying to make one last attempt at both Rachel and the ball. It was a train wreck in the making! Rachel, the sweeperback and goalie collide hard all crashing to the ground! However, not before Rachel somehow manages to get her foot on the ball finessing it past the goalie into the corner of the net! It was an amazing unassisted coast to coast goal, attesting to Rachel's incredible athleticism, stamina, intensity and ability to focus under extreme pressure! I will never forget that moment I caught on camera and the pleasure and honor it was to have been one of Rachel's many proud coaches!" Coach David Scott, Rachel's varsity soccer coach at Hand, was quoted as saying, "Rachel as a forward can beat three players at one time with her dribbling and quick speed and she has phenomenal technical abilities. Coach Scott considered Parri's strongest attribute to be her attitude. 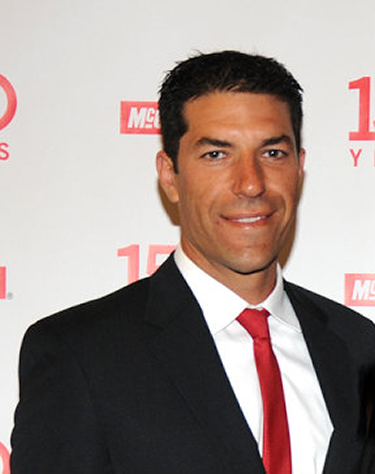 He also said, "as great as she is, Rachel is a very modest individual and she handles success extremely well." "She can play at the highest level and she is destined to do great things!" And great things are exactly what happened to this incredibly talented and humble woman! 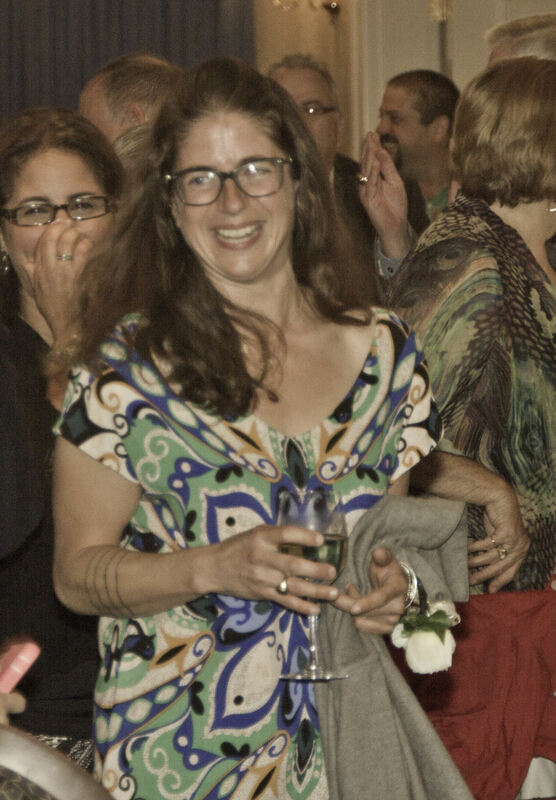 For starters, Rachel was a four- time Hammonasset Division All-Conference Soccer Player, named to the All-Time New Haven Register All-Area Girls' Soccer Team in 1997 and voted the MVP of that prestigious squad! Rachel was named a four- time Connecticut All-State recipient as well as a three- time NSCAA All-New England player. She went on to receive back to back, the NSCAA's Umbro Connecticut Player of the Year in 1996-97. By Rachel's junior and senior year, Parade Magazine named Rachel Parri a two time All-American and she closed out those years by being named a National Soccer Coaches Association of America two time All-American in 1996 and 1997! Rachel Parri is the only female athlete in the history of Daniel Hand High School to ever achieve that double All-American distinction! 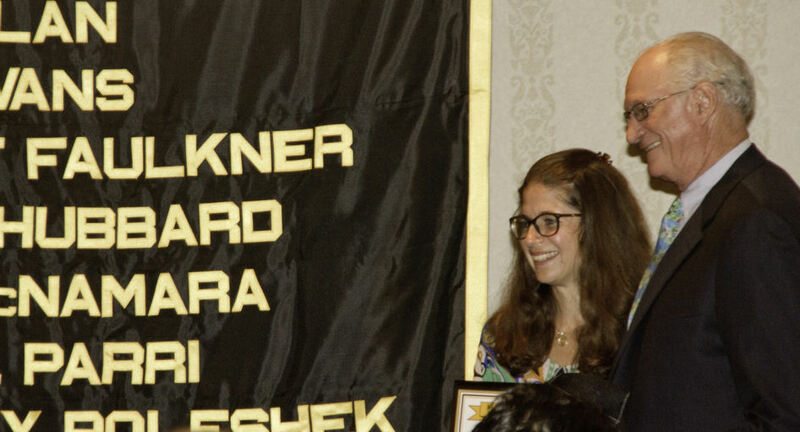 Rachel, while at Hand, was also a winner of the Presidential Fitness Award, two- time Track MVP, and captain of her soccer team as well as an honor student. Anson Dorrance, Head Coach of Woman's Soccer at the University of North Carolina (Chapel Hill) and the US Women's Olympic Soccer Team wrote the following comments in a handwritten letter to Rachel after seeing her play during a summer training camp at UNC. "Rachel, you are a wonderful player. I love your speed, quickness, strength with your ability to pressure the ball and your technical decision making. You also have an endearing personality…you are so humble! You can put a huge stamp on the game every time you play. You have unlimited potential and as I told you, "you can play!" In college, Rachel attended Wake Forest as a freshman helping her team to the post-season. Rachel then transferred her sophomore year to Boston College where she started in every game, leading the Eagles to the post-season as well. She was named to the NSCAA All-Northeast Region Team, earned the AD's Award for Academic Achievement and also earned Big East Academic honors. As a senior and captain, Rachel started in all 22 games and earned First Team All-NEWISA honors. After Rachel's graduation, she played professionally as a member of the United Soccer Women's League which won a National Championship in 2001 and later Rachel served as a Boston College assistant coach for the 2002 season. 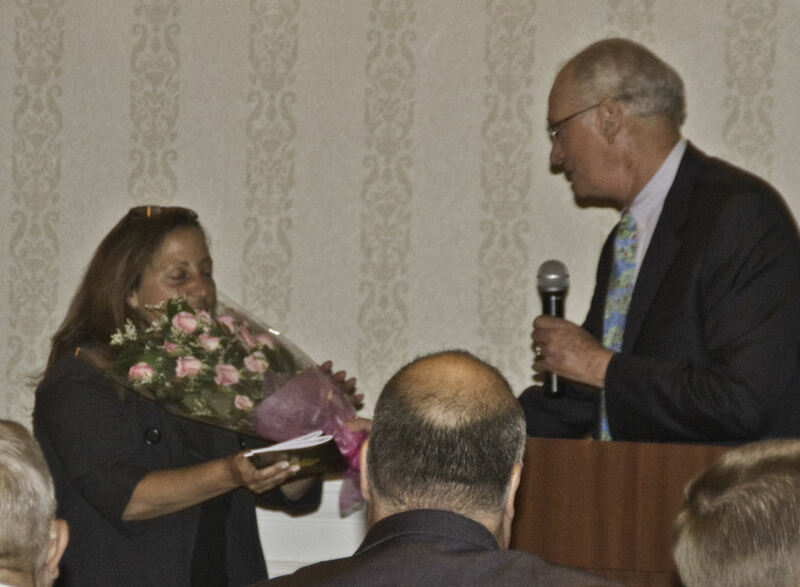 The final frosting on the cake, so to speak, came when Rachel was inducted into the Connecticut Girls' Soccer Coaches Association Hall of Fame in 2008! 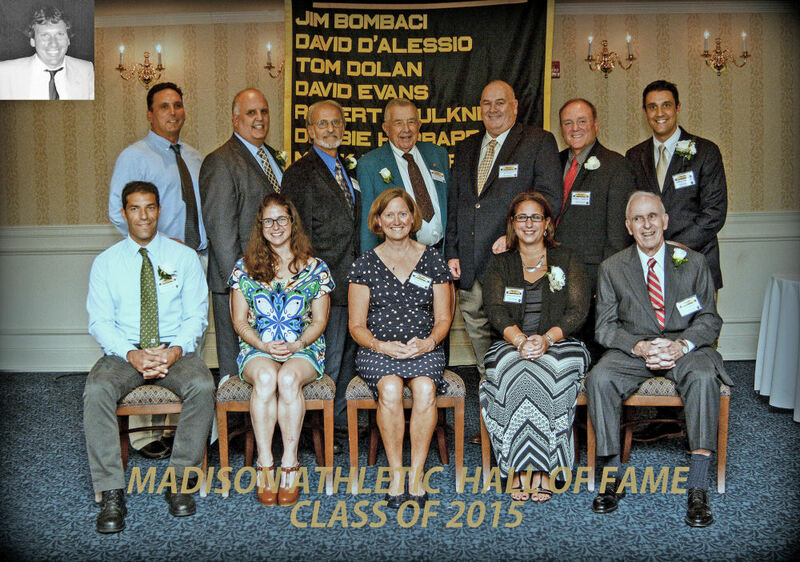 Boston College classmate Paul Coppola and now teacher at Daniel Hand High School concludes, "I believe Ms. Parri has earned, in both character and athletic accomplishment, the honor as a Madison Athletic Hall of Famer. 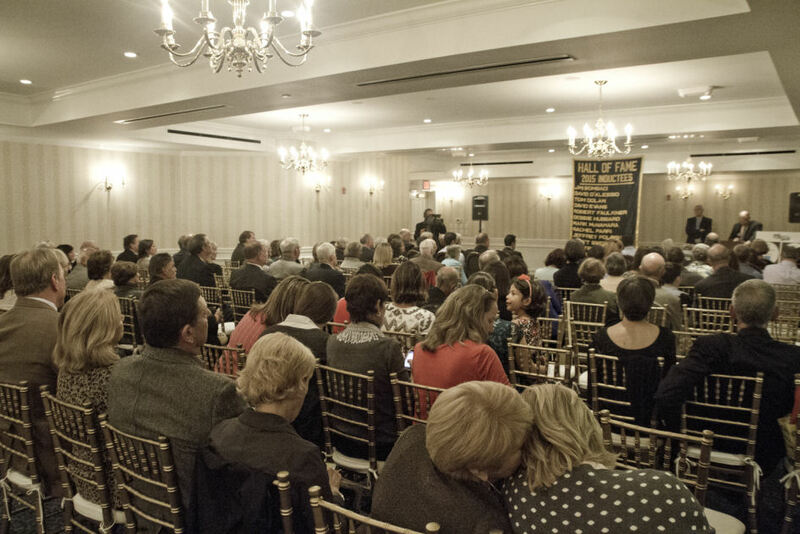 It is the most significant honor to be inducted into the Hall of Fame in one's hometown and by one's alma mater!" Presently, Rachel resides in beautiful foothills of Boulder, Colorado where she is taking intense computer programming courses of study. 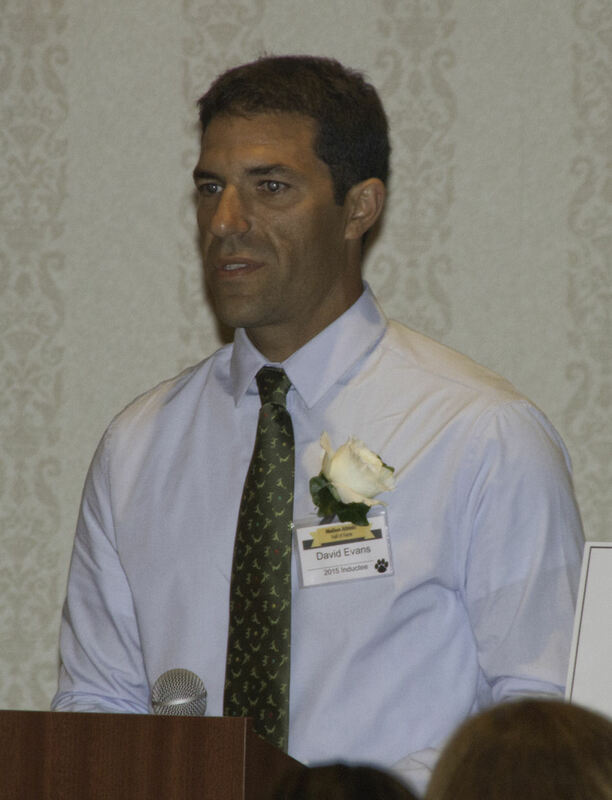 Jeff Poleshek, Class of 1992, was a four-year varsity tennis and soccer letterman, four-time number one singles player, and four-time MVP in tennis. One might say that 4+4+4 must add up to something greater than a "golden dozen" if those numbers were to serve Jeffrey, right? And they certainly did. In 1992, Jeff Poleshek was the Connecticut State Tennis Open Champion and a Prince All-American. Jeff had some similar traits and beliefs as the gifted superstar Roger Federer, who said, "I enjoyed the position I was in as a tennis player. I was to blame when I lost and I was to blame when I won. I really liked that, because I played soccer a lot, too, and I couldn't stand it when a loss was blamed on the goalkeeper!" Jeff made no excuses for a poor playing day on the tennis court or the soccer field. He believed that "success is failure turned inside out." He was a take-charge athlete who said little, yet dominated his position as a singles player in tennis and a "freight train" defensive stopper back. Jeff was known as a fast and strong athlete who always got to the ball quickly in both his varsity sports. Jeffrey's renowned soccer coach Bob Faulkner, considered Jeff one of his all-time best defensive backs. Coach Faulkner commented, "If you were an opponent coming straight down the field towards Jeff, that player would be wise to chip the ball to the outside wing rather than meeting up with Jeff Poleshek and the "Jaws of Death!" In his sophomore year, Jeff received the Coaches' Award in soccer and was named best defensive player on his team. By his junior and senior year, Captain Jeff Poleshek made First Team All-Shoreline as well as First Team All-State. As much as Jeff loved the hard fought battles of competition in soccer, tennis was Jeff's true focus. He started playing tennis successfully at an early age. By the time Jeff entered Daniel Hand High School, he was already primed to excel as the tennis team's number one singles player. Later that season, he was a Shoreline Semi-Finalist, All-Shoreline First Team pick, and recipient of the Coaches' MVP Award. By Jeff's sophomore year, he was the Shoreline Singles Champion and named CIAC All-State First Team his junior and senior year. He was also the CIAC State Open Champion! 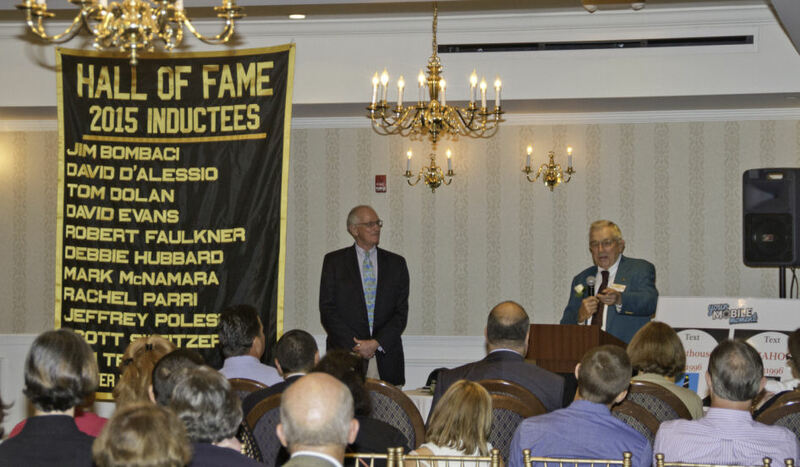 CIAC Hall of Fame Coach Gary Meunier, presently perennial tennis "Godfather" in Fairfield County, has much praise for his former captain. "First of all, Jeff was an outstanding student-athlete. 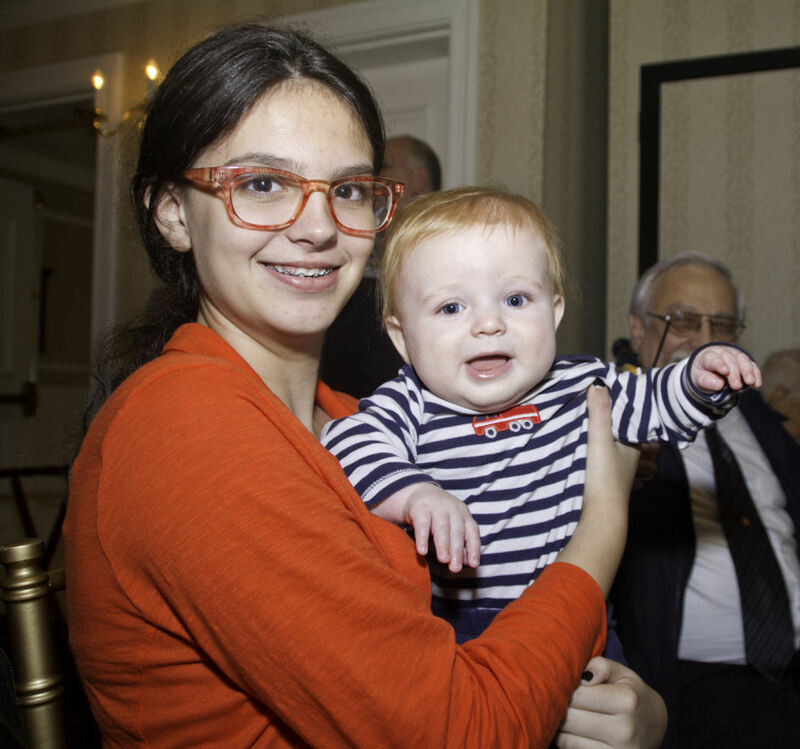 He demonstrated impeccable behavior and sportsmanship just very precocious for his age! He was a product of old school upbringing which contributed to Jeff's being an outstanding role model both in his role a team captain as well as off the field. Jeff had an endearing relationship with our faculty and a spotless discipline record while attending Daniel Hand High School. It was a remarkable accomplishment that in his senior year, Jeff won the CIAC State Tennis Open making him the top player in the state and the Register's Player of the Week!" Coach Meunier continued to reflect on Jeff's State Open win, saying, "This was beyond anything we could expect at this point! We've been running all over the place adding to this story-book ending. Jeff really put an exclamation mark on the season with that win! It's been so exciting and I can't say enough about the kid!" Coach Meunier concluded, "part of Jeff's success comes from his ability to recognize when he is becoming stagnant on the court. That's when he steps it up. He's always keeping that subtle pressure on his opponents. Reporter Roberto Gonzalez, The Hartford Courant staff writer, commented in a sports article, "Madison's Jeff Poleshek wasted little time in earning the CIAC State Open boys tennis title. Playing almost flawlessly, Poleshek took only 50 minutes to defeat Wethersfield's Dave Huck 6-1, 6-1 at Hamden High School." Jeff's tennis success continued while he was a student at Bates College. He played all four years, working his way up to the number one singles and doubles positions. In 1995, Jeff won the Singles Championship in the State of Maine, and came back the following year to win the Doubles Championship in the State of Maine. Jeff has the distinct privilege of being the top player on the best team in Bates' Men's Tennis History (49-8). 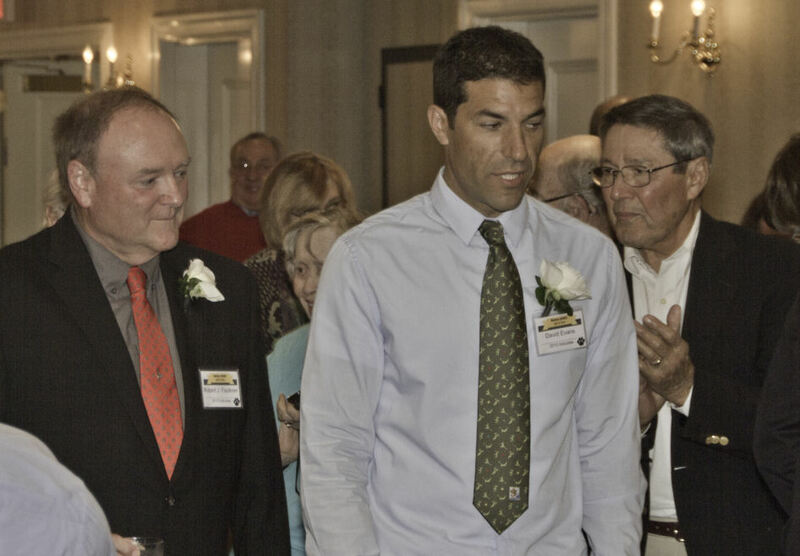 There is no question why Jeff Poleshek was inducted into Bates College Tennis Hall of Fame in 1996. Jeff resides in Sarasota, Florida, with his wife Kendra and two daughters, Marin and Clara. He is the Assistant Vice President and Director of Facilities of Ringling College of Art & Design. Jeff continues to play competitive tennis in the Make a Wish Tournament. 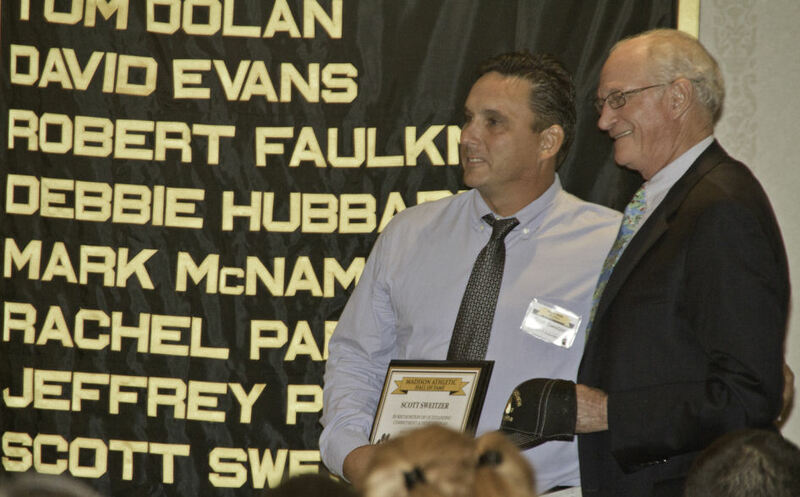 Scott Sweitzer, class of 1984, was one of the most outstanding football players in the history of Daniel Hand High School. The youngest of four brothers to play football at Hand in the seventies and eighties, Scott set numerous school or state records. 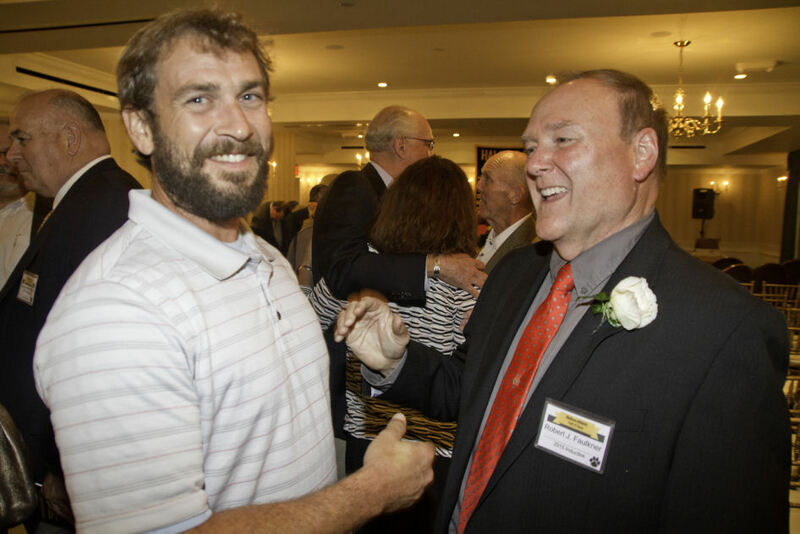 In 1983 Scott set a Connecticut state record that will never be surpassed when he became the first and possibly the only Connecticut football player ever to play in four state championship games. Scott was a starter on offense, defense or both for four Hand state finalists from 1980-83. He helped lead 11-0 Hand to the class M state championship and the number two ranking in the state in 1982 as a star wide receiver and defensive back. Scott was twice named to the All-State team. As a freshman in 1980, Scott became the first Hand freshman to earn a varsity football letter. Scott went on to become the first Hand football player to letter four times. After 44 years of Hand football, Scott is still one of only three Hand football players to letter for four years. In 1981, his sophomore year, Scott was already a two way starter as a split end and defensive back. Scott was selected to the honorable mention All-Shoreline team as a defensive back after the 1981 season. By Scott's junior year he was future All-American quarterback David Thompson's favorite passing target. Scott set Hand school records for most touchdowns in a season (11) and most yards receiving in a season (603) in 1982.In speaking of Scott's pass catching skills in a September, 1982 Shoreline Times article Coach Larry Ciotti stated ''I don't think the pros could do it better" Scott was named to the All-Shoreline and All-State teams as a wide receiver. Hal Levy, Sports Editor of the Shoreline Times said "Scott was the best player he saw in the 1982 season". Prior to his senior season, Scott was selected to the pre-season Street and Smith's All-America team. Teammate and future pro Jim Bell said "Scott was an excellent leader and captain'.' Scott was the leader of a Hand team that was ranked number twenty five in the nation in an October, 1983 USA today article. Scott was again selected as an All-Shoreline and All-State wide receiver. During Scott's Hand football career he set school records for career receptions (102), career receiving yardage (1668), touchdown receptions in a season (11), receiving yards in a season (603) and most interceptions in a season (7) which equaled his brother Ken's 1977 record. Scott's receiving records were Hand records for over twenty years. Thirty-one football seasons later, Scott still holds the Hand records for most career touchdown receptions (27) and most career interceptions (20). Scott remains tied for the Hand single game records for touchdown receptions (3) and interceptions (3). Scott was also an excellent basketball player. He was the starting varsity point guard for two seasons. Coach Bill Barker said Scott was "an excellent competitor who helped lead Hand to the Region I Class L championship in his junior year." Scott's contributions also helped Hand win the Shoreline Conference championship in the 1982-83 season. Scott's "defense on the press, classy passes and take-charge play ignited Hand's resurgence at the end of the 82-83 season" said the Shoreline Times in March, 1983. As team tri-captain in 1983-84, Scott led Hand to a 13-7 season. Scott showed the full range of his skills with 13 assists, 6 rebounds and 4 steals in a game versus Morgan that season. 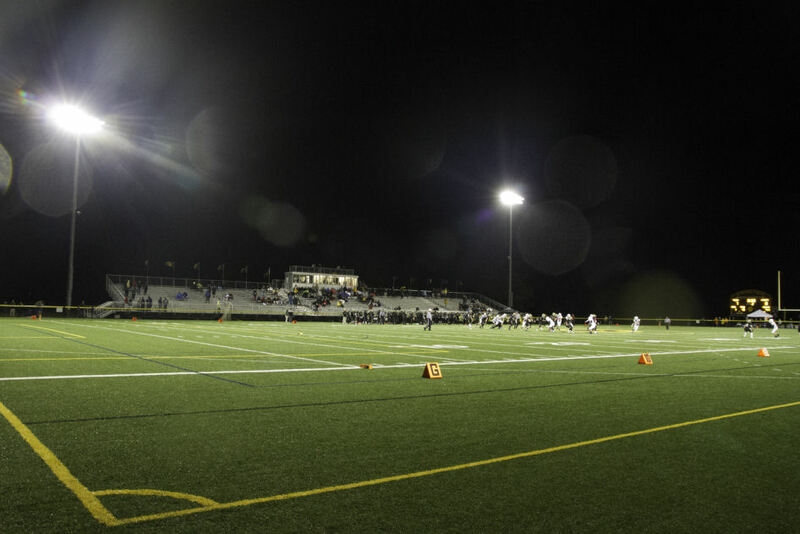 After being recruited by over fifty colleges in his senior year, Scott attended the University of Connecticut on a football scholarship. At UConn Scott set records for receptions by a tight end (103) and receiving yardage by a tight end (1243). In his senior year Scott was selected as team captain. Scott was chosen as a member of the All-Yankee Conference first team and as an honorable mention All-American in 1987. 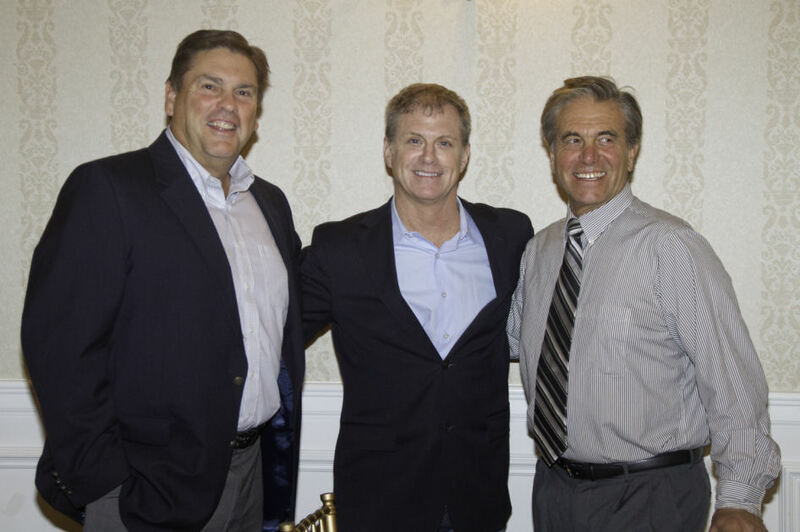 On the 100th anniversary of UConn football in 1998 Scott was selected as one of the top 50 UConn football players ever and became a member of UConn's All-Time team along with his brother Ken. 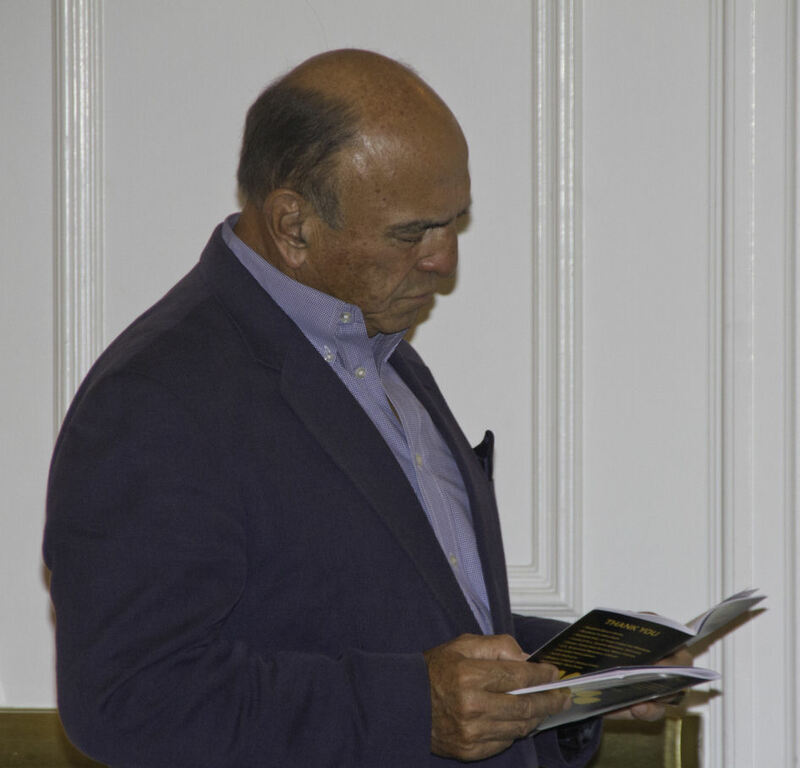 In summarizing Scott Sweitzer's football career, Coach Larry Ciotti stated "Scott Sweitzer became the finest receiver in the history of Hand football. His skill level surpassed many great receivers of that era. He had the ability to make plays to win games that big time players do again and again. He played in four state championship games. The University of Connecticut honored him by selecting Scott as one of the top 50 players in UConn history. Scott was unquestionably the best receiver that I have ever coached". 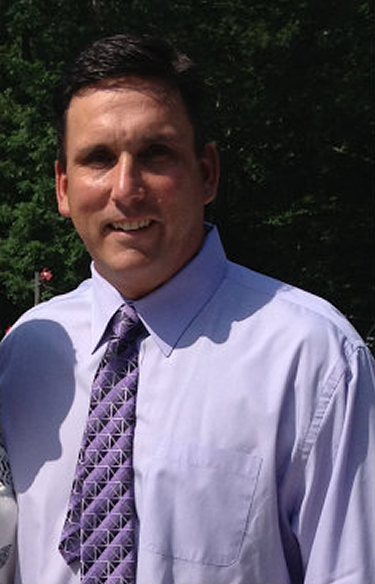 After graduating from college, Scott was a graduate assistant coach at UConn in 1988. 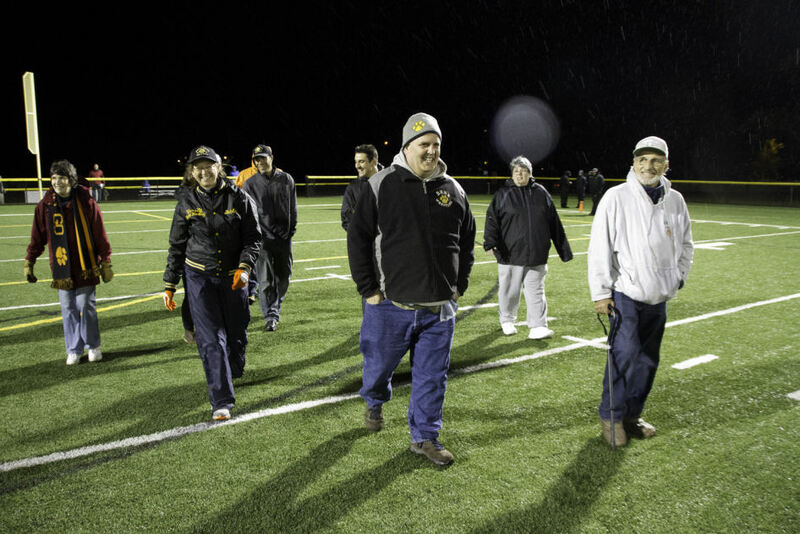 He has remained closely associated with Hand football as a long time assistant coach. In addition, he coaches youth football and has served as President of Madison Youth Football. Scott has also had a very successful career as a business owner. Scott is married to Kristi and they have five children: Olivia, a college junior at Belmont University, Scottie, a freshman at Syracuse University, Shane, a sophomore at Choate, Sophia, 13, and Seth, 11. Lou Tresselt, class of 1947, was one of the most outstanding Hand athletes of the World War Two era. 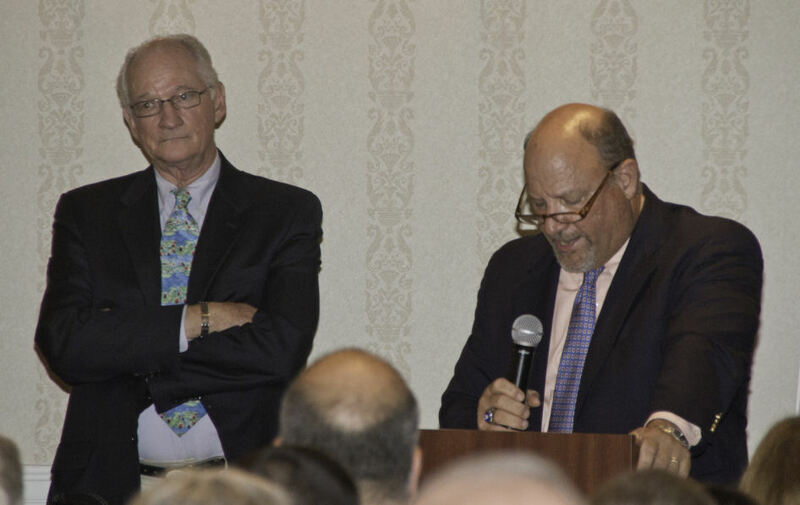 Lou was the first to ever play on the Hand Varsity Baseball team as a seventh grader, thanks to Milt Jeffrey and Derl Hess, who both recognized his talents. Lou was also an excellent leader who captained two varsity sports teams as a Hand High athlete. Lou began his varsity baseball career as a second baseman. As his arm strengthened, he became the regular shortstop. A very versatile and skilled fielder, Lou also played many other positions, including pitcher and catcher. He became a catcher in his last two years because "no one else could." An outstanding hitter, Lou batted third or fourth in the lineup, and hit for both average and power. Lou served as team captain in his junior and senior years. Following high school, Lou was offered the opportunity to sign a professional baseball contract by both the Boston Braves and the St. Louis Cardinals, but he declined to sign because he was just getting started in the bookbinding business, and was seriously dating his wife to be, Betty Adams. Along with baseball, Lou played football for four years. In football, he played quarterback, an unselfish position in six man football because the quarterback must hand off to a running back. Lou also played basketball for three years, although, according to him, "it wasn't his best sport." After high school Lou concentrated on his occupation in the bookbinding business and married life with his wife Betty. 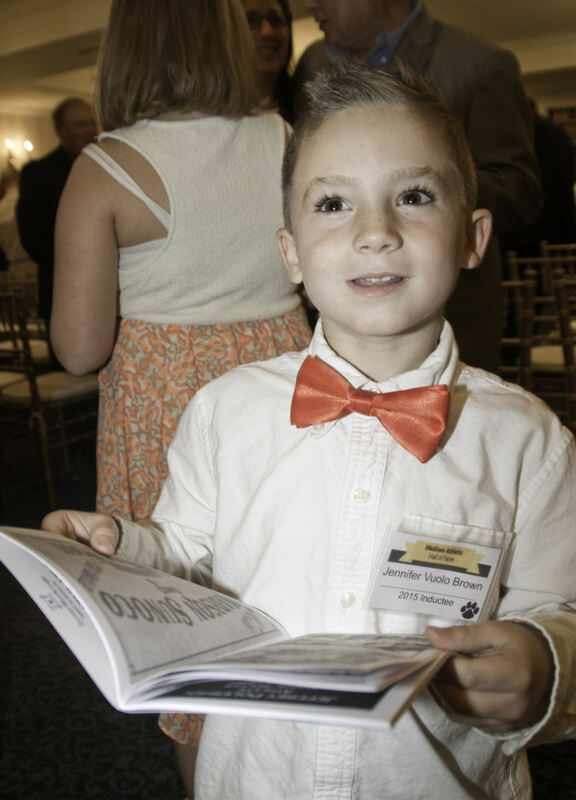 For the last ten years of his working life, Lou was part owner of the Hartford Bindery. Lou and Betty were married for sixty years until she passed away in August. From 1951-53, Lou served in the United States Army in Japan which he considered "a great experience." Lou did find time to play for the Madison Townies semipro team in the Shoreline League from 1947-60 (except for the two years he was in the army). Lou also served as team manager in the nineteen fifties. He was regarded as the best player on the team and was selected as Shoreline League MVP in 1953. The Shoreline League was very popular with baseball fans and "played to big crowds on Sundays in those days." As team manager, Lou was known for taking "under his wing'' young stars Dan Mulvey and Mike Donahue. Lou was recognized by his players as an excellent mentor. 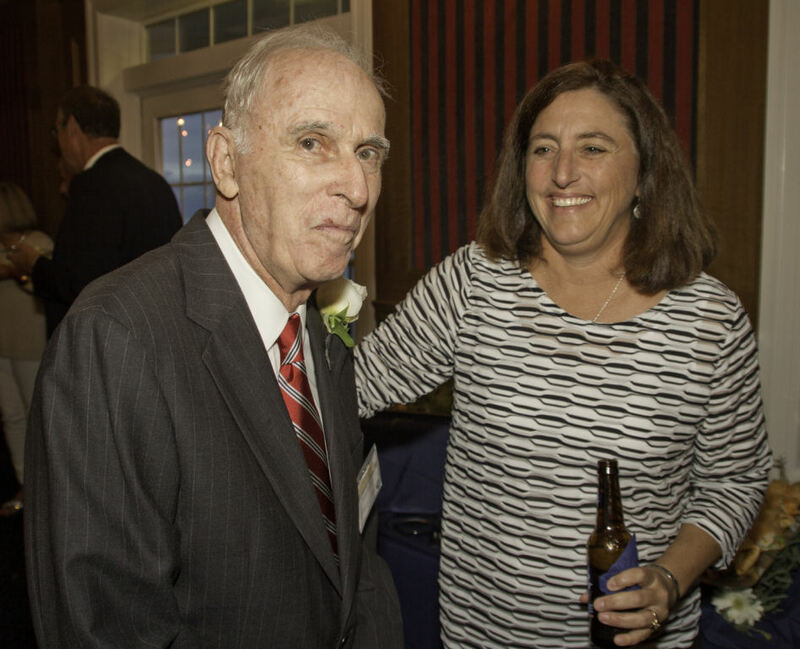 Dan Mulvey has known Lou for over sixty years and describes Lou as "selfless, humble, kind, altruistic and genuine." 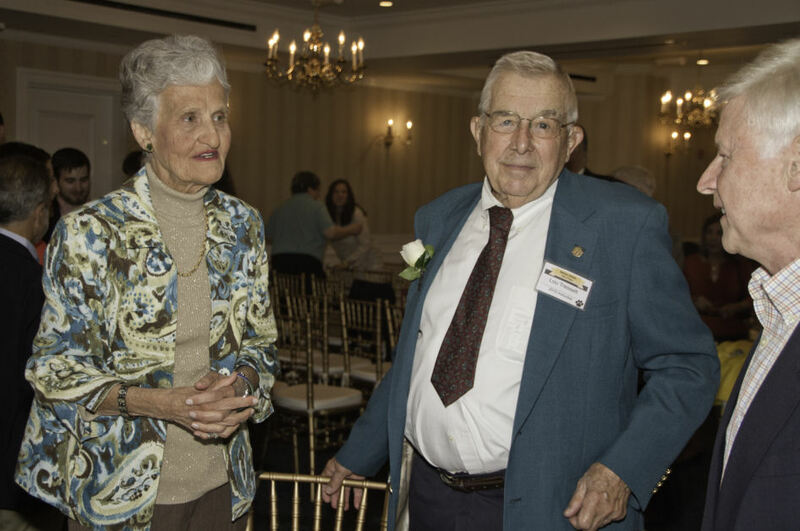 Lou and his wife Betty were both very active in the Madison community. 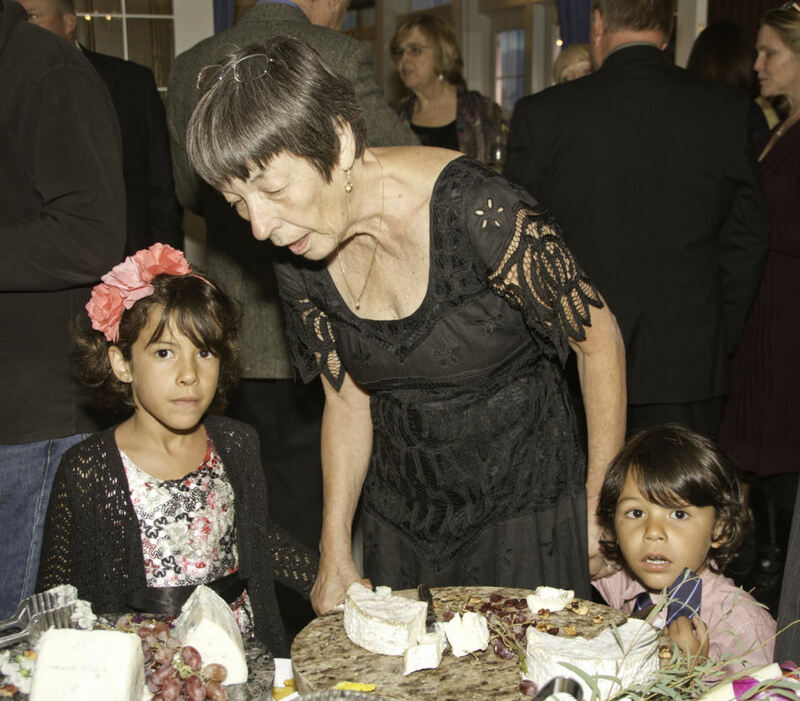 Betty was a teacher at Island Avenue School for twenty seven years. 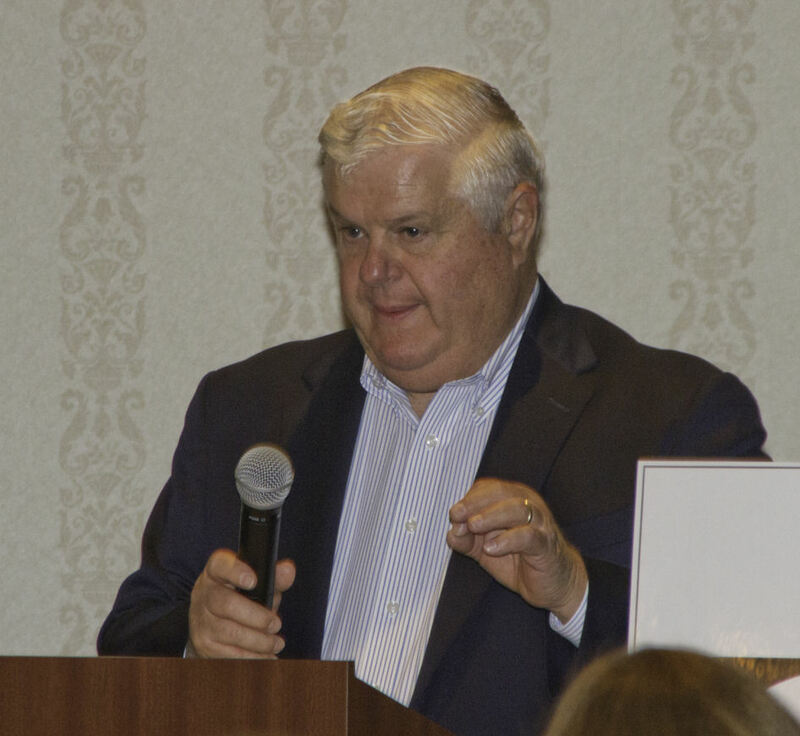 Lou received the Madison Jaycees Distinguished Service Award in 2006. Lou has been a member of the Madison Lions Club since 1968 and has twice served as Club President. He has been a Melvin Jones fellow since 2003, which is the highest award given by Lions for humanitarian service. 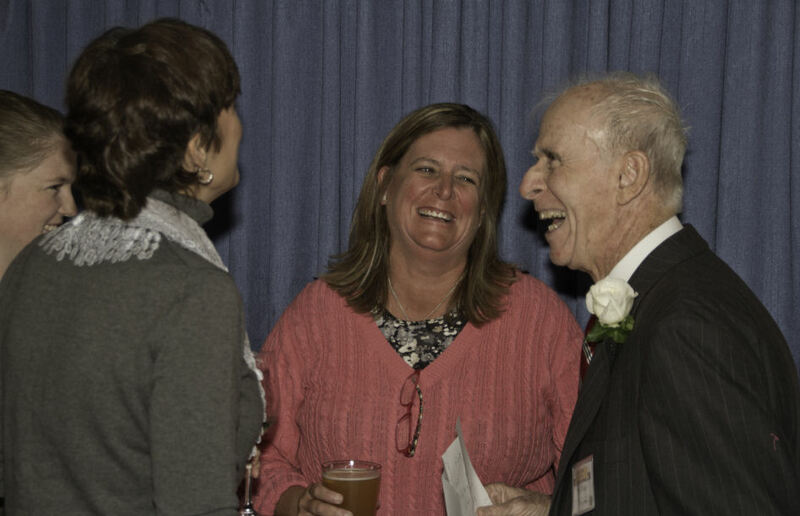 Lou Tresselt has been a lifelong contributor to the athletic and civic life of Madison.